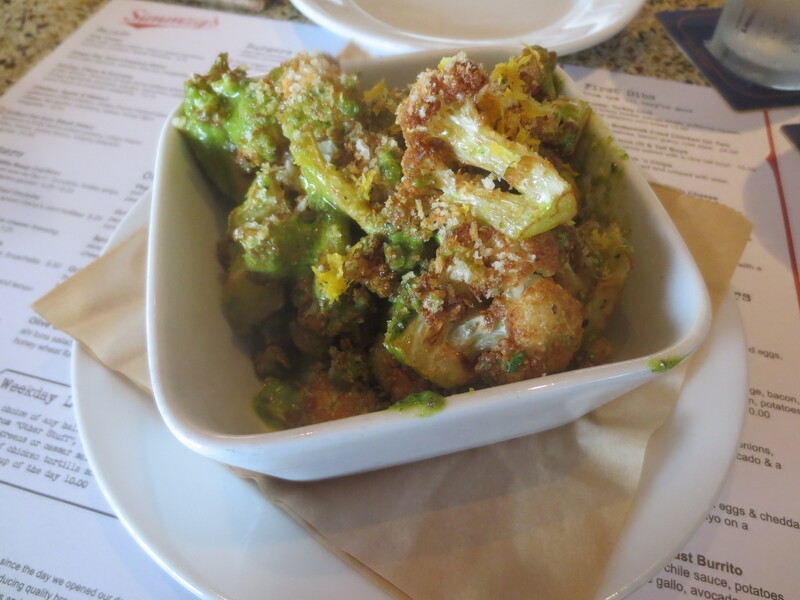 Nibble’s New Obsession: Simmzy’s Cauliflower With Cilantro Pesto. It’s from Simmzy’s Eat – Drink – Pub — I had seen photos of great looking food at Simmzy’s and have wanted to dine there for some time. While in Huntington Beach recently, we stopped at Simmzy’s for a Beer and Starter. Only one, since we had just dined at Saint Marc footsteps away, but we had to try something. We opted for the Cauliflower with Cilantro Pesto, caramelized florets with Garlic Breadcrumbs and Lemon (pictured above and described below). 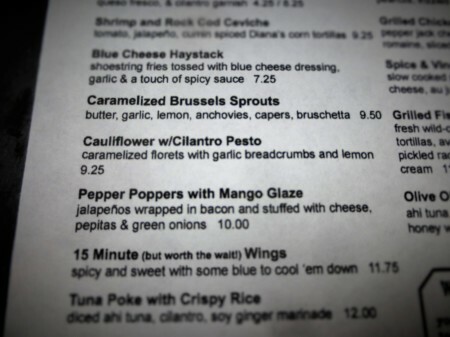 It has such a tasty, bold, lemony flavor I had it again at Simmzy’s Long Beach location a couple weeks later. Simmzy’s Eat – Drink – Pub’s Long Beach location is on a corner in Belmont Shore (below). 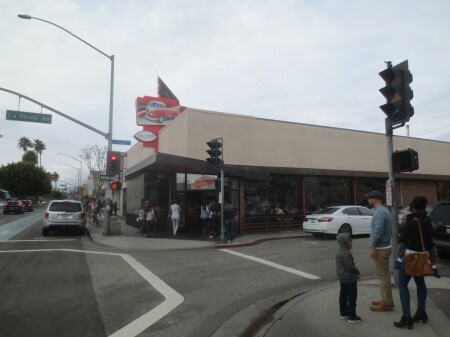 It’s where the Shore House Cafe used to be when I lived in Belmont Shore years ago. 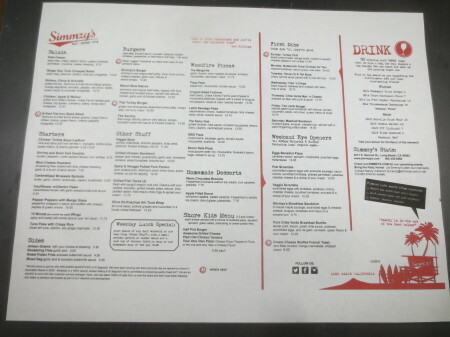 Simmzy’s Menu — Enlarge for a better view. 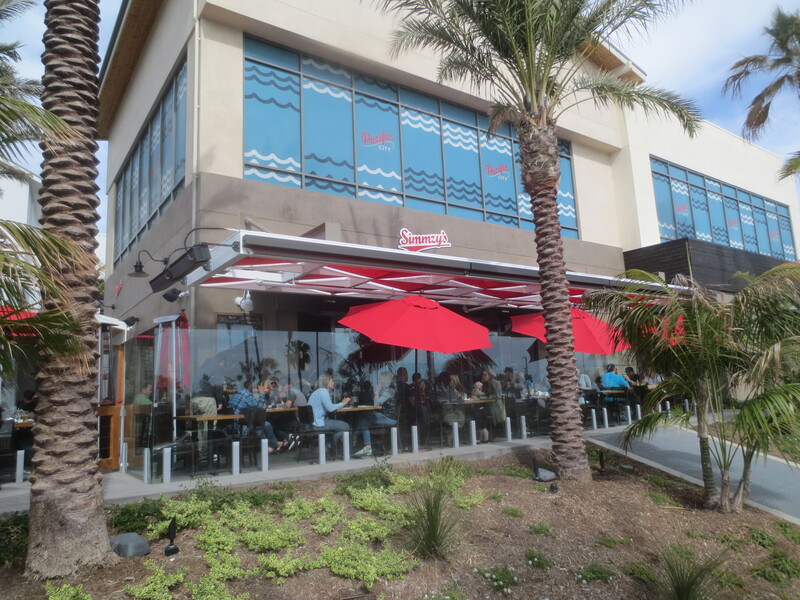 Simmzy’s Huntington Beach location is pictured above — Most seats offer an ocean view across PCH. 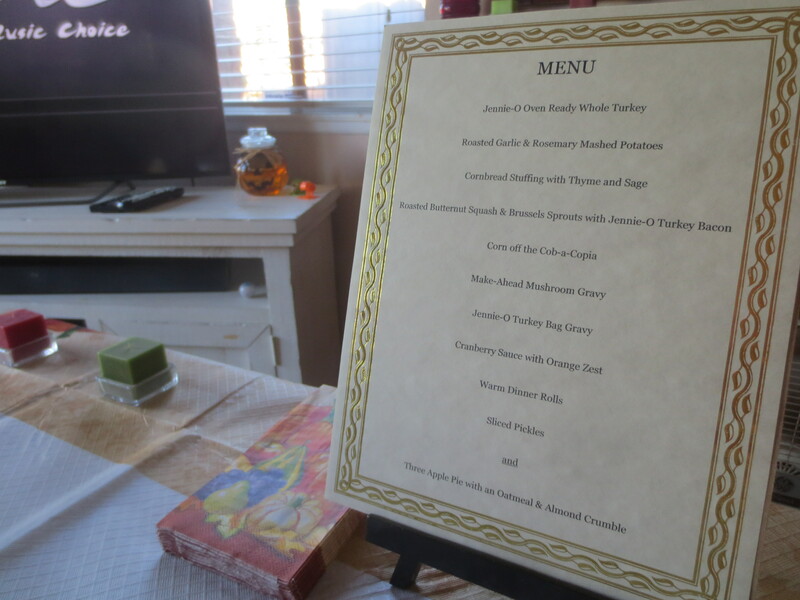 We’re Thankful For Jennie-O’s Turkey And Thanksgiving Menu Ideas. Wow, it was a perfect Turkey that went from the freezer directly into the oven without effort — It’s the Oven Ready Whole Turkey from the Jennie-O Turkey Store. It’s ready to be cooked in a bag. It’s true what the package says — The Turkey browned in the bag, was tender and tasted great. 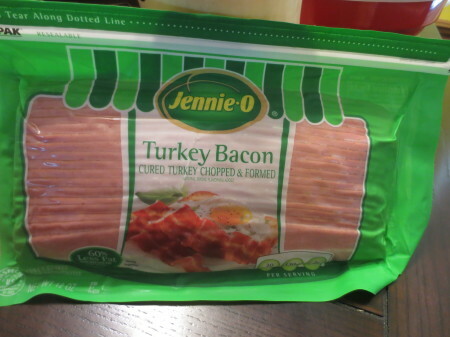 I didn’t know Jennie-O sold such a Turkey. I didn’t have to remove the giblets, yay! 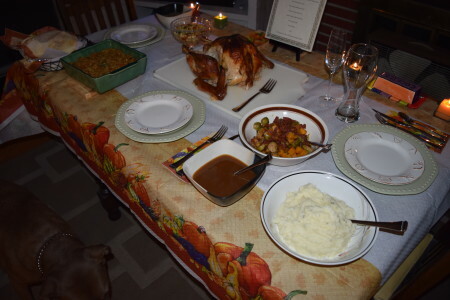 Since the Turkey was so easy to prepare, I made a complete, early Thanksgiving Dinner. 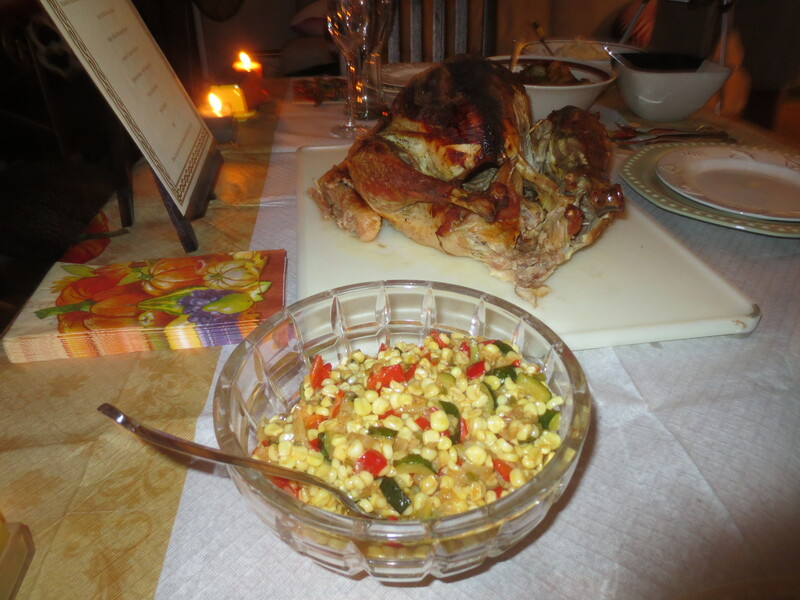 I got several ideas and inspiration from the Jennie-O website, especially the Holiday Sides page. And surprisingly I discovered that I like Turkey Bacon, though I wasn’t even sure I wanted to try it. 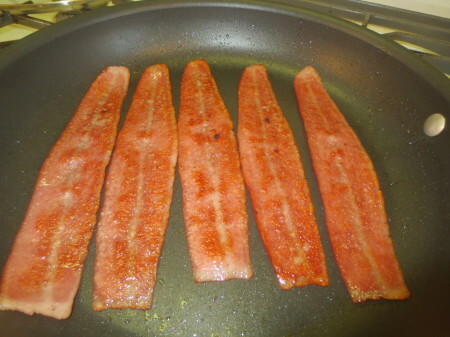 It looks quite different than Bacon in its raw state. It feels like Bologna, kind of looks like a surfboard and fake Bacon with a line running down the middle, but it tastes pretty good, like Bacon. 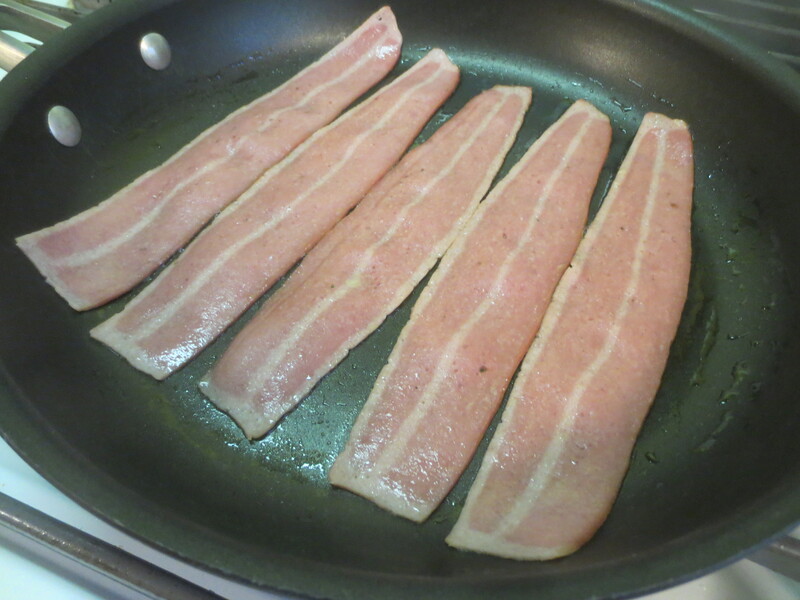 Turkey Bacon cooks up nice and crisp, but it’s a little harder to tell when it’s done. I accidentally burnt the first batch, but the second batch (below) turned out well. There is a fine line between burnt and nicely crisp. 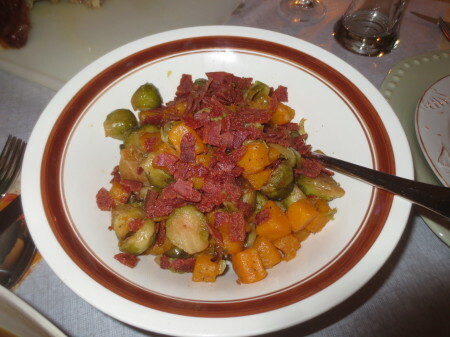 Turkey Bacon is in a few of the Jennie-O Thanksgiving Side Dishes. I will definitely buy Jennie-O’s Oven Ready Whole Turkey and Turkey Bacon again. I appreciate the coupons they sent us. I gave away a couple of them. 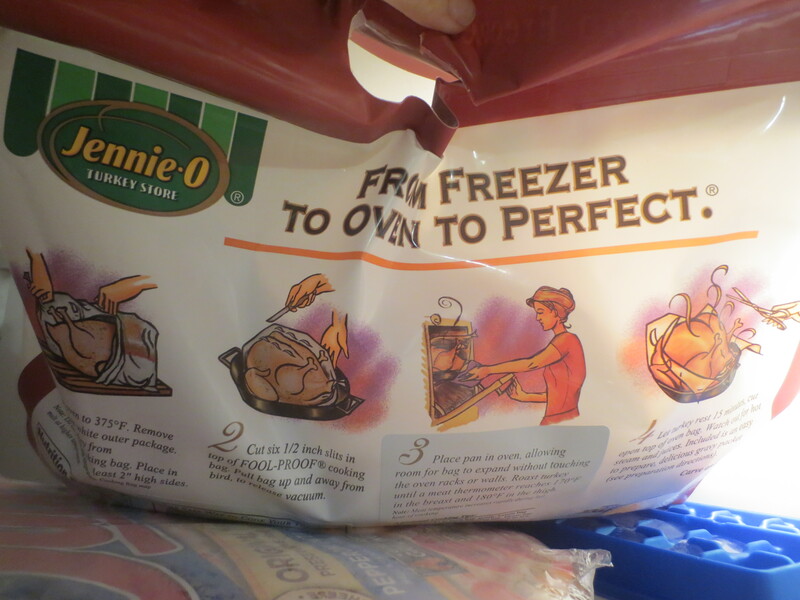 When purchasing Jennie-O’s Oven Ready whole Turkey, a lady in line in front of me, expressed her love for Jennie-O products and had never seen their Oven Ready Whole Turkey, so I gave her one of the Jennie-O coupons to try it too. Thank you Jennie-O! I tried a couple products I never thought to try before and actually really like ’em. I have a better appreciation of Jennie-O’s products. They offer much more than we thought. 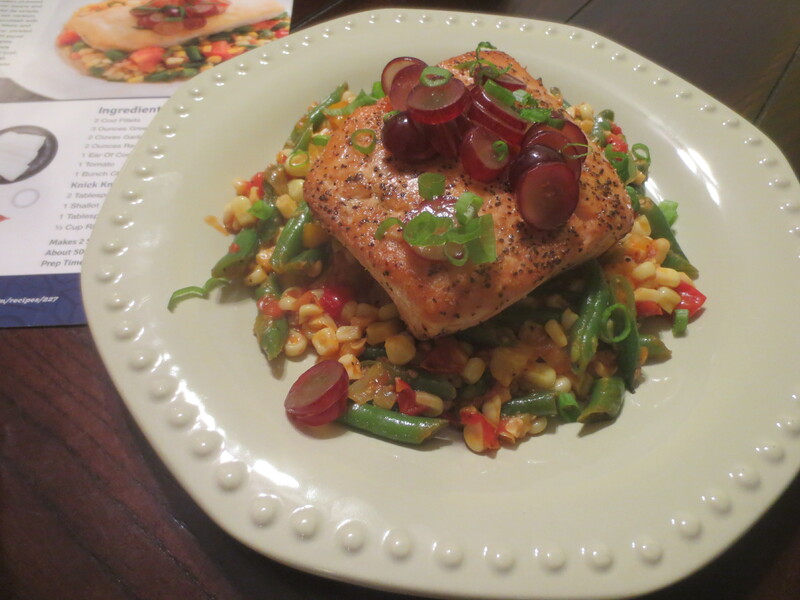 Winning Salad Ingredients Inspired By Blue Apron Meals. 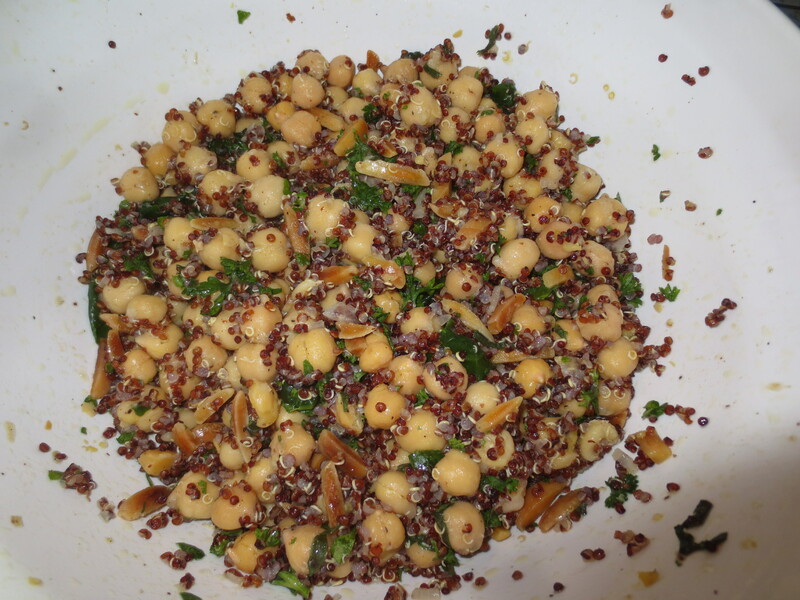 It was Red Quinoa, introduced by Blue Apron, that inspired me to create the pictured Red Quinoa and Garbanzo Bean/Chickpea Salad, with Shallots, Parsley, Mint, Arugula, Toasted Slivered Almonds, Red Wine Vinegar, Dijon Mustard, Olive Oil and Salt & Pepper. 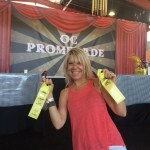 It was for the OC Fair’s Culinary Arts Competition this year and I won a 5th Place Ribbon for it. 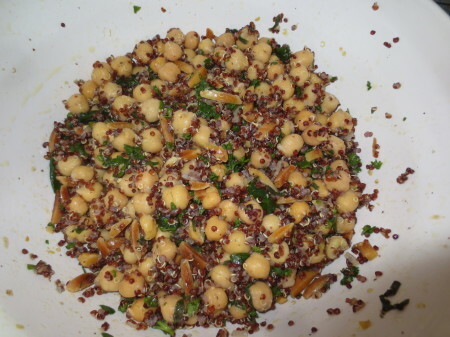 Measurements aren’t listed, because they didn’t need to be submitted — I just fine tuned the combination until it tasted great and now it’s a Salad I’ll forever make in varying combinations, with Quinoa, Beans and Nuts. 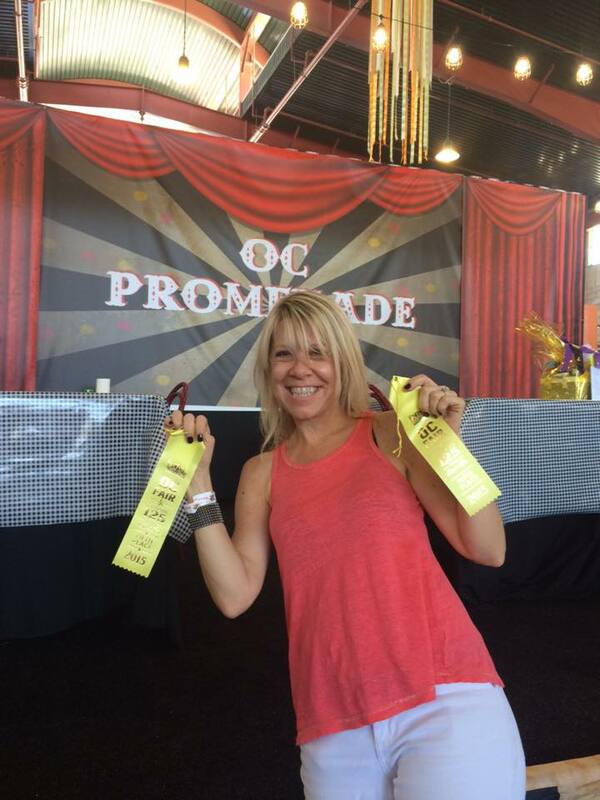 I won a second 5th Place Ribbon for a different Salad using Orzo Pasta, Broccoli and Pine Nuts. 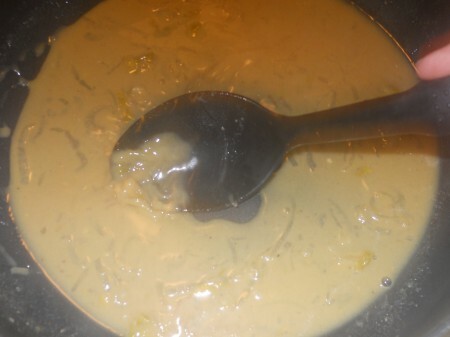 Recipe Photo Contest: Bad Time To Taste Better Than Photograph. Not sure that my photos will be chosen this go around, but we enjoyed the meals, though I’d rather have the $500 per photo prize from the Idaho Potato Commission for entries in their Recipe Photo Contest. There’s still time to enter for a prize, or at a minimum eat a good meal. The pictured weren’t chosen as official entries in the Idaho Potato Commission’s contest. Each is a different dish/recipe in the contest, ending May 29, 2014. 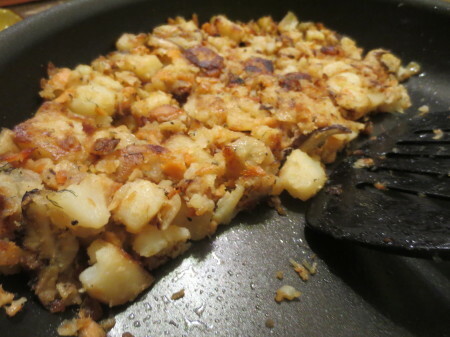 I made and entered (3) of the (6) posted recipes (from top down) — The Salmon and Shitake Idaho Hash that’s half eaten, the Western Scramble introducing the Eggs, and the French Red Wine Infused Idaho Grown Fingerling Potato Salad, a snooty sounding Salad with hard to find Fresh Chervil. Latest Induction Into The Chili Cheese Fries Hall Of Named: It’s Portillo’s. 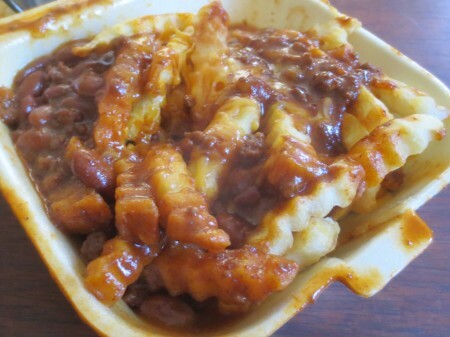 Did you know that we taste and compare Chili Cheese Fries? We do and our Orange County Chili Cheese Fries Comparison Report, with photos of all consumed thus far is linked here. We recently tried and liked Portillo’s Chili Cheese Fries, which have just been added to our ongoing post. Learn more about all here and/or suggest your favorite and we’ll give ’em a try. Not Close Enough Is Our Verdict: No Dinero For These Potatoes. 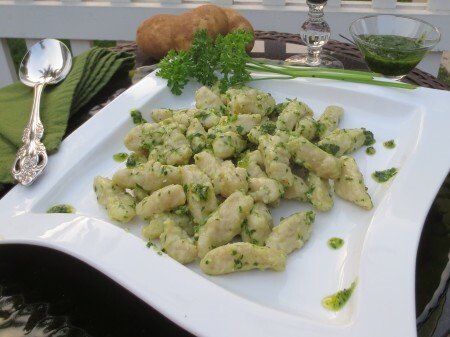 Well… I learned how to make Gnocchi (a good thing) and other dishes I’d never choose to make, but didn’t win a prize. 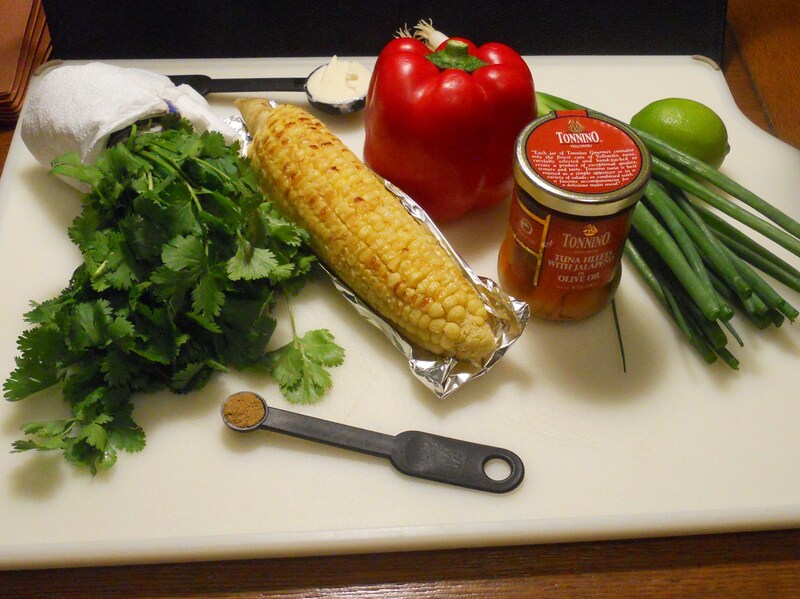 All was for a Recipe Photo Contest sponsored by the Idaho Potato Commission. My photos weren’t selected and I think I know why. It’s all about the food (or Potatoes in this instance), not background, though important too, and I didn’t get close enough. Or the competition was stiff. I don’t know. I appreciate the incentive. Moving on… to packin’ for moving, as previously reported — I’ll compete again when time. 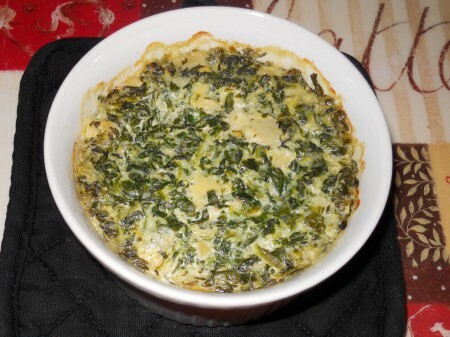 Potato Vegetable Casserole Supreme: Hit Of The Recipe Photo Contest. 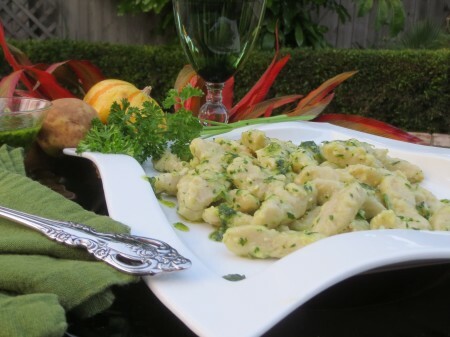 The ten winning photographs in the Idaho Potato Recipe Photo Contest are now posted on the Idaho Potato Commission’s website here. As previously reported, one of my ten entered photographs was chosen as a winner. 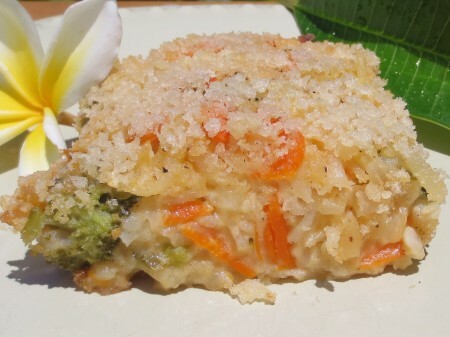 Pictured here is the Idaho Potato Vegetable Casserole Supreme, which didn’t win, but is our victor for flavor — Recipe and winning photo are here. 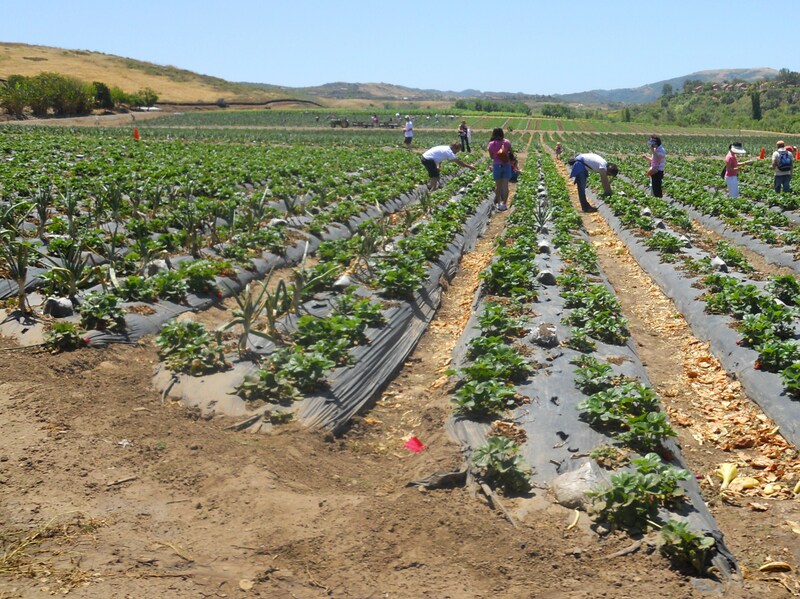 Playin’ Hot Hooky Potato: Escapism Through Incentivized Meals. 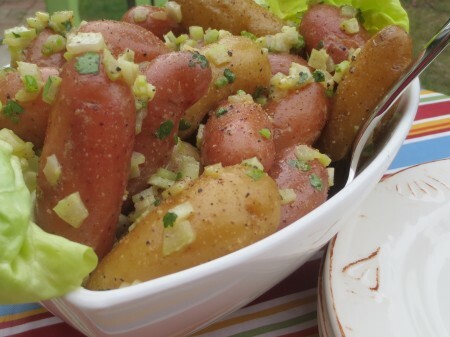 One month left to submit final photographs in the Idaho Potato Recipe Photo Contest. 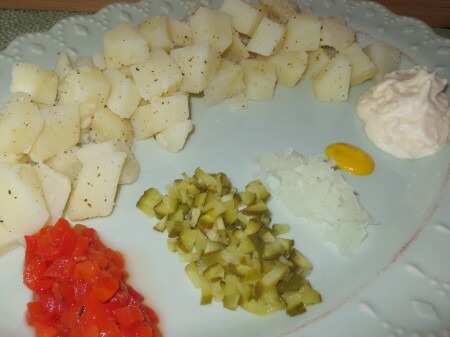 I’ve been busy making dishes that generate photos I’m not allowed to publish — Five Idaho Potato Recipes down and five to go. 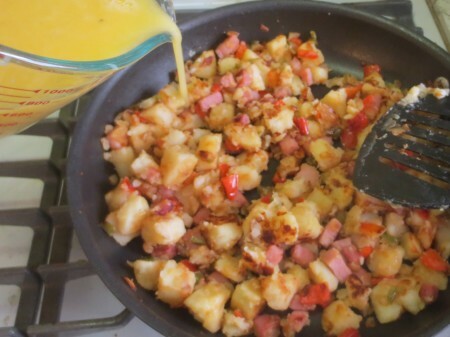 The challenge is to prepare and photograph at least (1) of (10) select recipes using Idaho Potatoes and submit it here to (hopefully) win $500 for each 1st Place photo. You may make and photograph all ten recipes and I’m on a roll, though I did make the easier ones first. 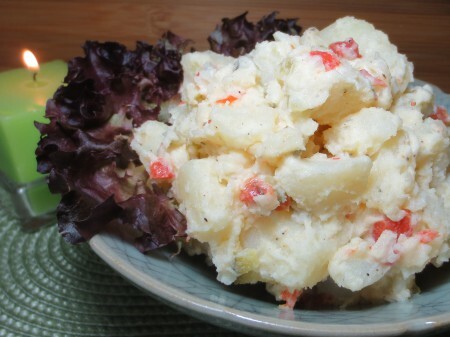 The pictured weren’t chosen as official entries in the contest, but relate to the “Quick Potato Salad For One” recipe. Mix top photo to make bottom photo. We loved the Idaho Potato Vegetable Casserole Supreme and plan to make it again. Corned Beef With Cabbage And Carrots Cooked On The Side (Please). 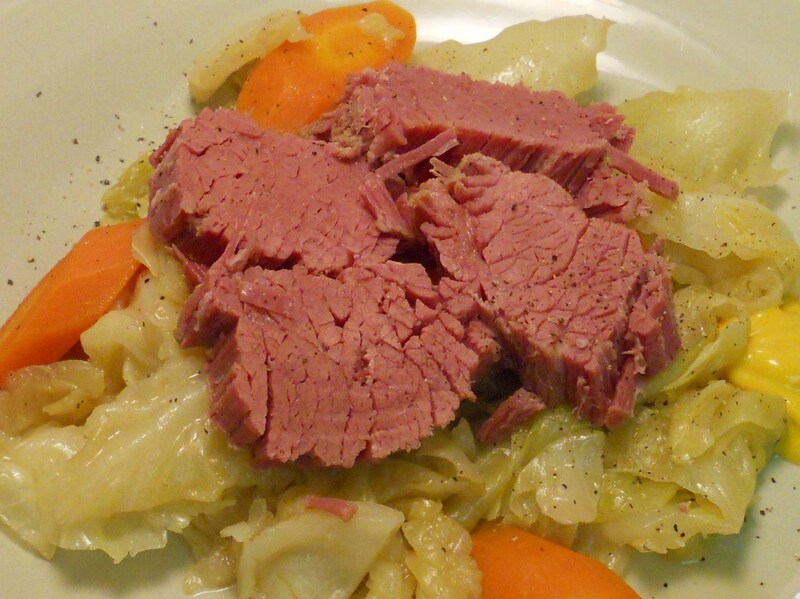 March is time for Corned Beef and Cabbage, and I always cook the Cabbage, Carrots and Potatoes on the side. No Potatoes were used this time, as I generally pick around them. 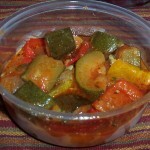 Why cook the vegetables on the side? Exhibit A (above), all the crap that ends up floating in the Broth, after the Corned Beef cooks in a Crock Pot (or Dutch Oven) for 10 hours. 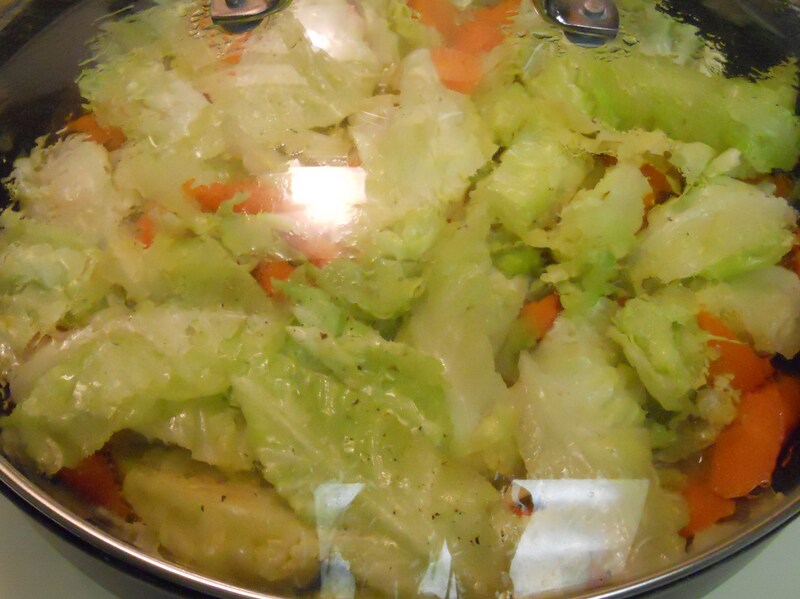 Instead I strain and boil some of the Crock Pot Broth, and then cook the vegetables in it. 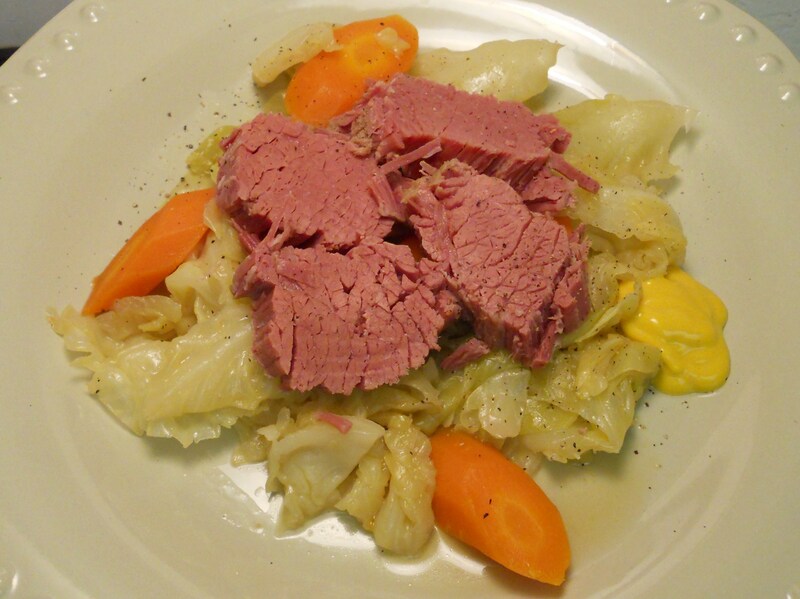 When the Corned Beef is ready to fall apart, I brown the vegetables in a little Olive Oil. And then add the strained, lightly boiled Broth to the pan, cover it, and cook all until the vegetables are tender — It doesn’t take that long. Why would you cook them for 10 hours? 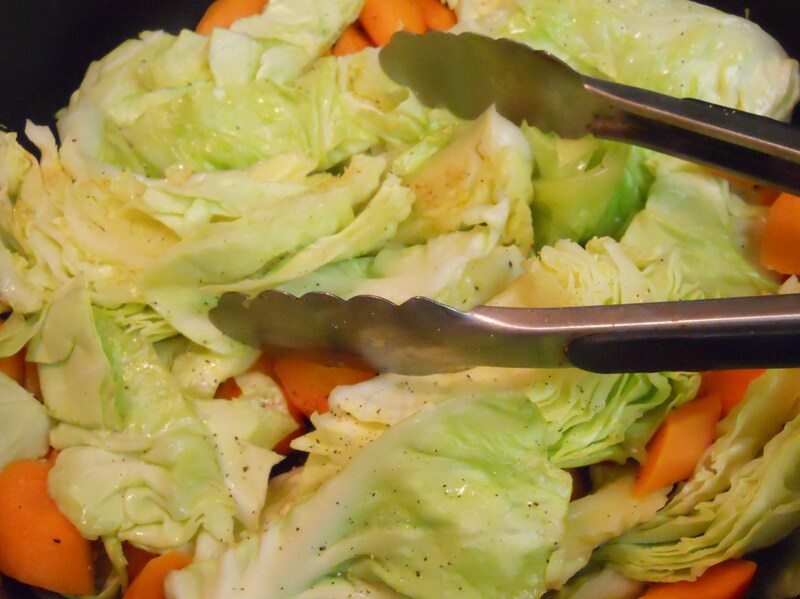 Finally, there is peace of mind knowing that nothing scary is hiding amongst the Cabbage. 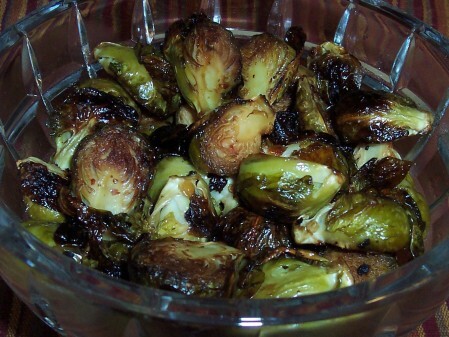 To Sir With Love: Mustard Braised Brussels Sprouts. A friend recently wrote…”Shelly, I just made this recipe and (if you like Brussels Sprouts) it’s SO DELICIOUS! Just wanted to share it with you.” Thanks D, I do and you made me make them. 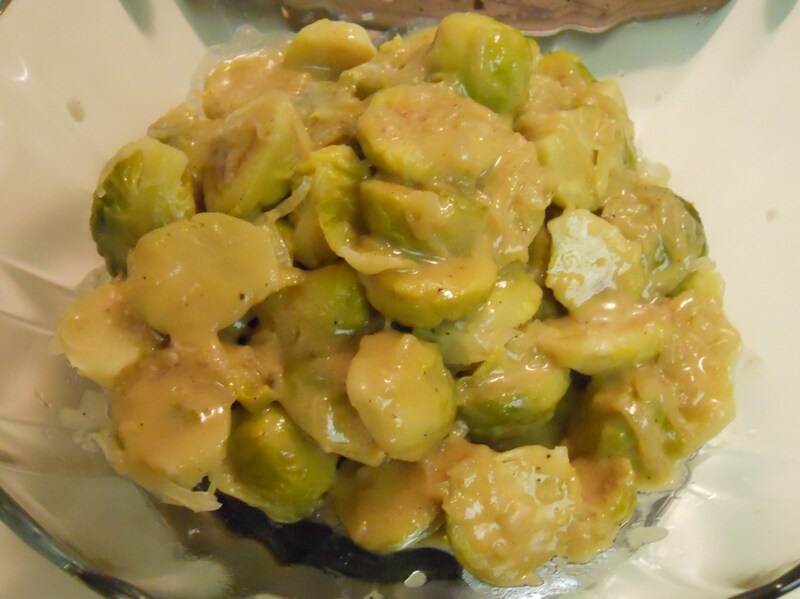 Mustard Braised Brussels Sprouts with Dijon and Shallots sounded good to me too. I thought the cooking process was interesting, especially the beginning. 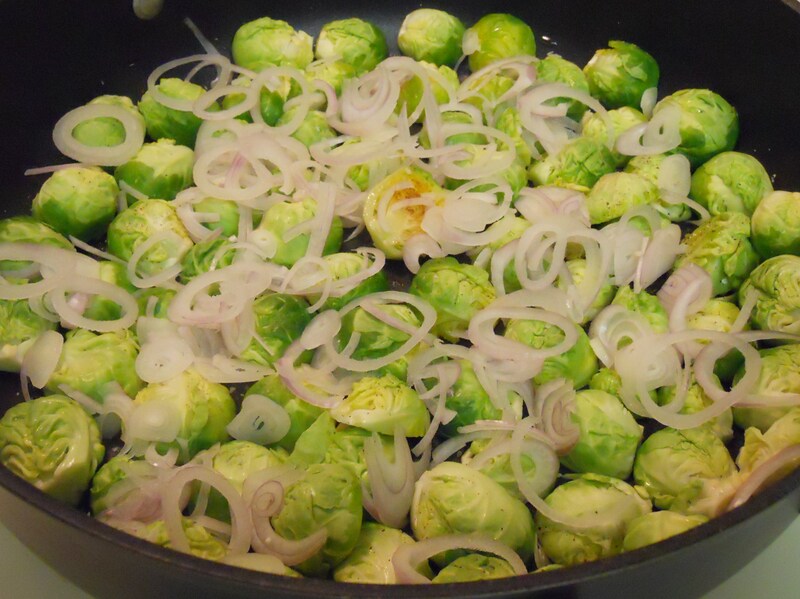 I like how the Brussels Sprouts are placed cut side down in Olive Oil undisturbed for 5 minutes — Most were golden brown. 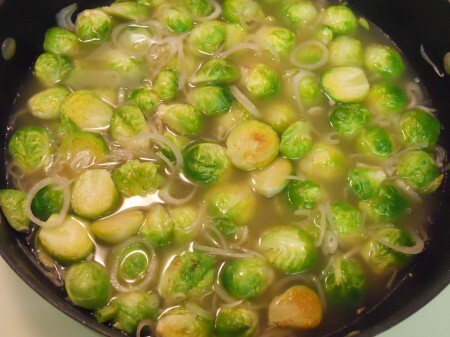 Shallots and Broth are then added and all is cooked covered for 20 minutes. 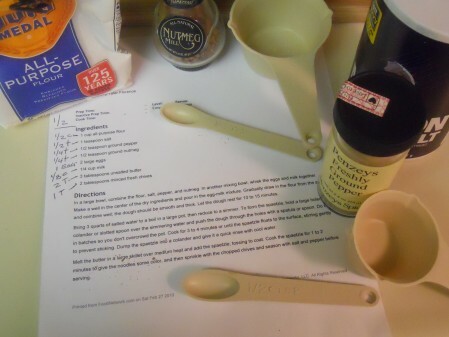 The exact RECIPE is here. 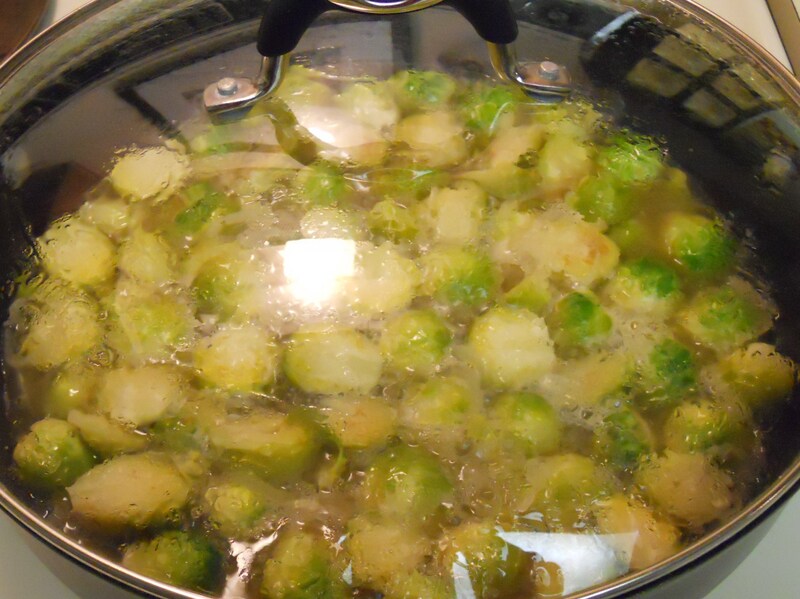 Remove Brussels Sprouts, stir in Dijon Mustard until well blended, and cook 2 minutes more. 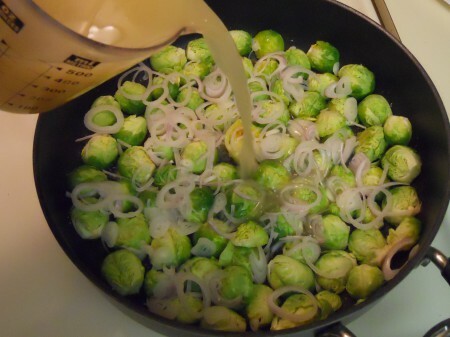 Pour the Mustard Sauce over the reserved Brussels Sprouts (add optional Parsley) and serve. Okay, it was good, but surprisingly rich — I didn’t love ’em like these, but all is well amiga. Artichokes With Walt’s Wharf Lea & Perrins Sauce At Home. 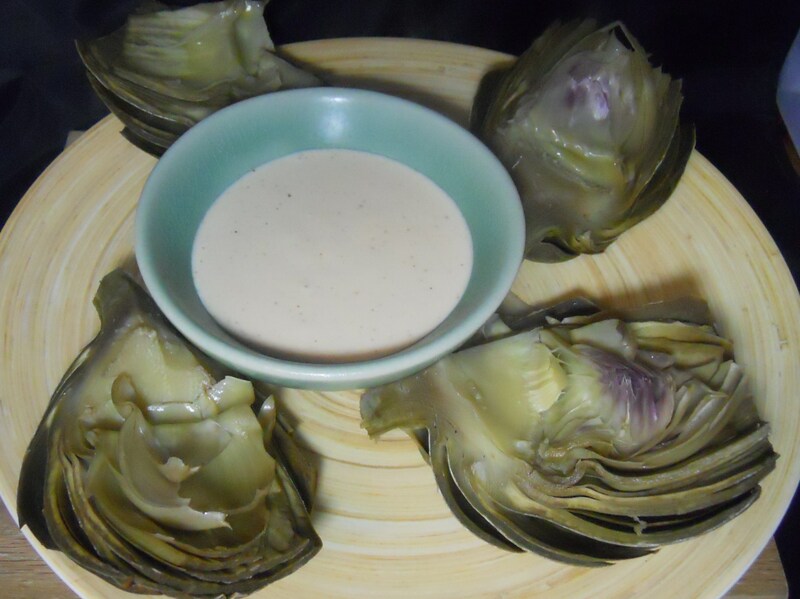 Have you ever tried an Oak Grilled Artichoke at Walt’s Wharf in Seal Beach? They serve one of the best Artichokes around. The flavor of the grill combined with Walt’s Wharf Lea & Perrins Sauce is superb. Since I don’t live as close as I used to, I make it at home. 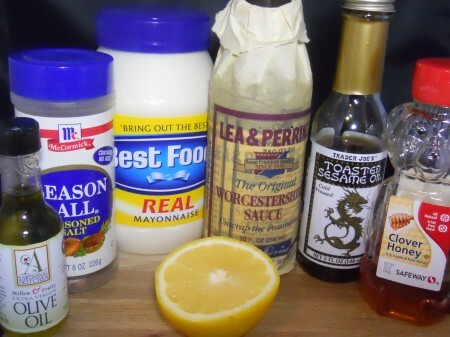 Ingredients for Walt’s Wharf Lea & Perrins Sauce — Mayonnaise, Lea & Perrins Worcestershire Sauce, Lemon, Sesame Oil, Olive Oil, Seasoning Salt and Honey. Recipe is below. 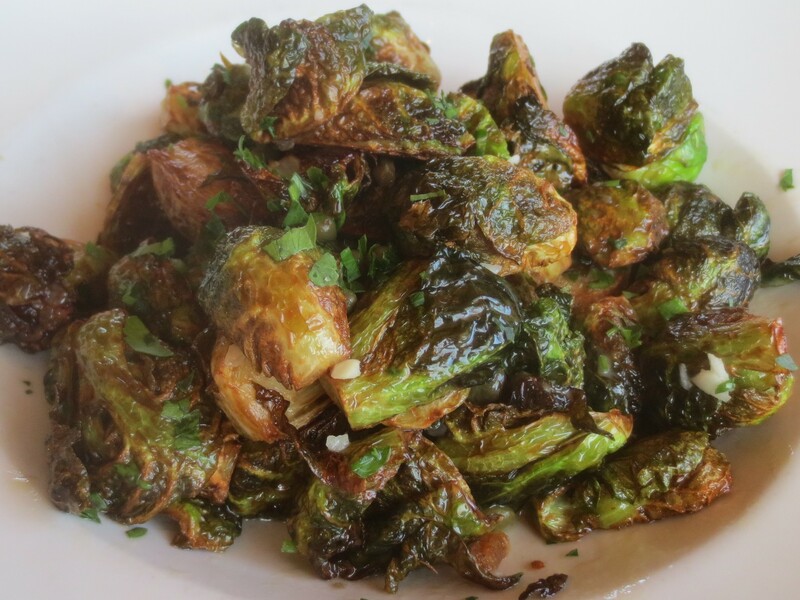 Walt’s Wharf Restaurant first steams their Artichokes and then grills them over Oak Wood for extra flavor. 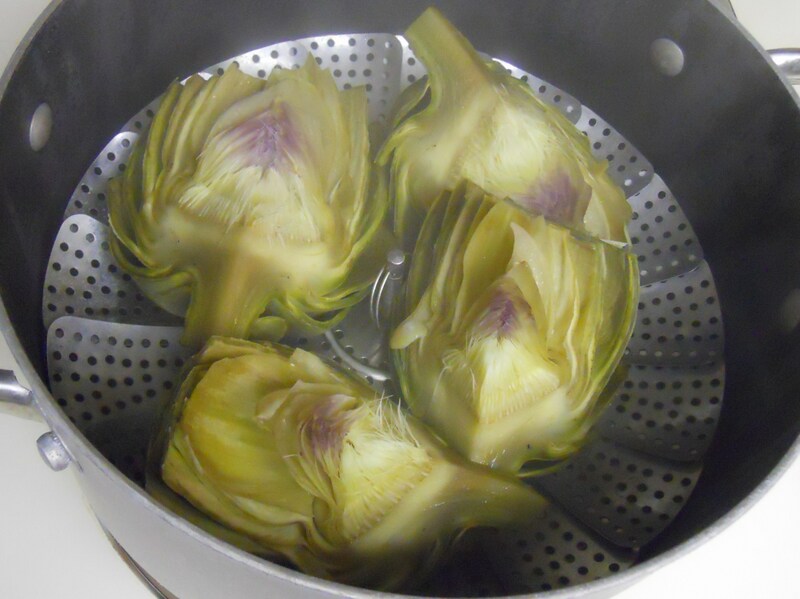 For ease, most of the time I just steam them, but do grill ’em on occasion too. I’ve had the recipe for about 20 years, as you can tell by its stained condition. 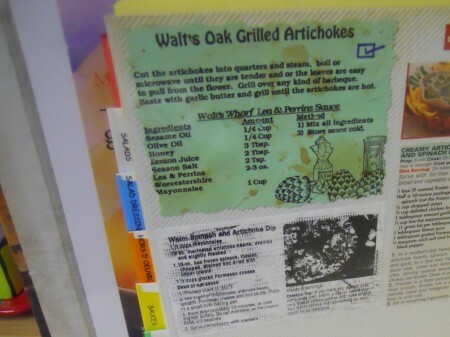 The Walt’s Wharf Lea & Perrins Sauce recipe is kept in one of four recipe binders created before Nibbles of Tidbits and a variation is linked here. 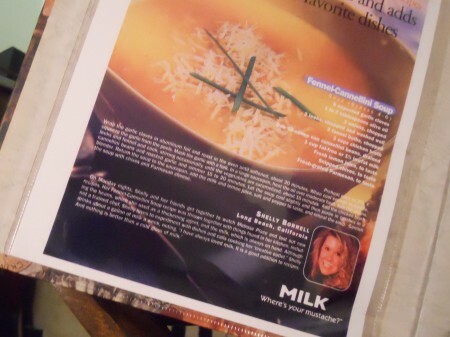 And semi-related, just because it’s in the same binder, is a photo from a recipe contest I won several years ago. Lucky me. 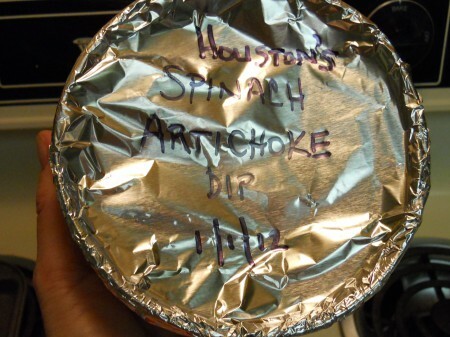 On the subject of Artichokes, Lucille’s Smokehouse Bar-B-Que serves an amazing one too. Note: A link will be provided to Walt’s Wharf Restaurant when it’s operable again — They say it was recently hacked and are working on it now. Check back. 06/03/11 Update: The Walt’s Wharf website is still bogus, but a few of us are heading there (Walt’s and Seal Beach) this Saturday for the real deal and more. We’ll see what’s goin’ down and update again. Homemade Spaetzle: Can I Get Pregnant From This? Have you ever tried Spaetzle? 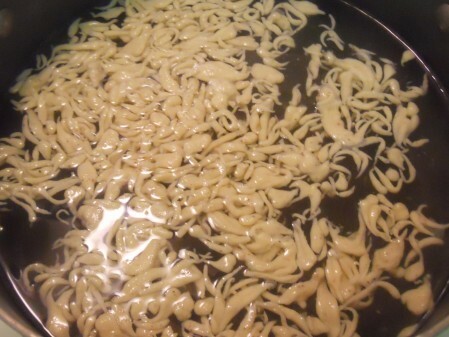 It’s a German Noodle. 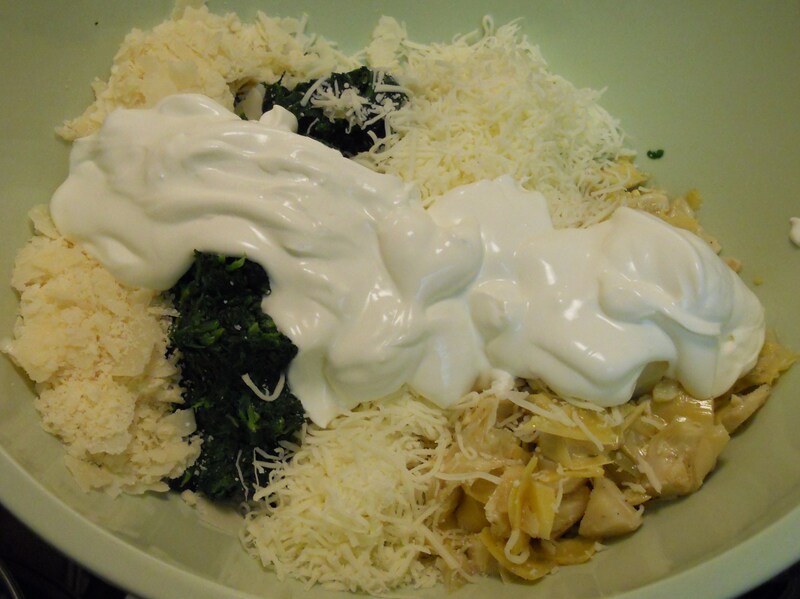 I hadn’t tried, nor made it, but was curious about it, since it’s so easy and quick to make. 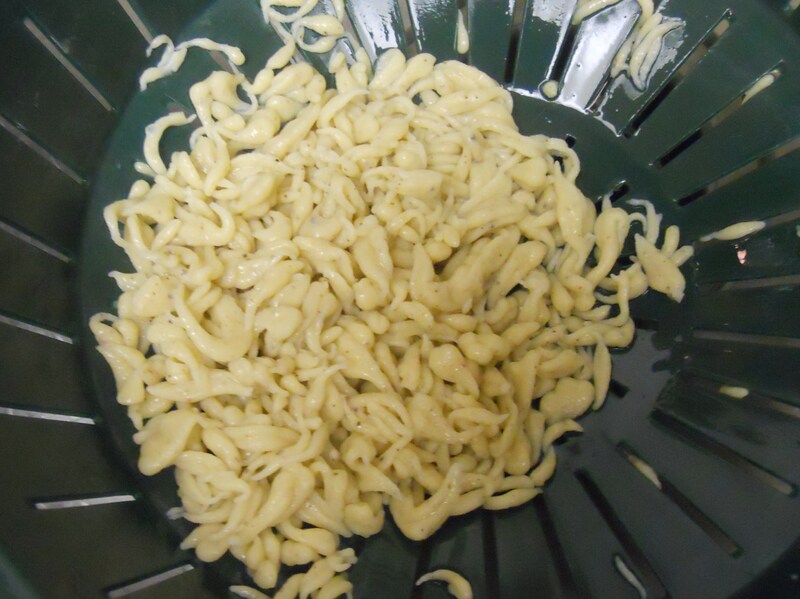 And compared to homemade Italian Pasta, Spaetzle seemed a cinch. So I made it here and I’m not in love. 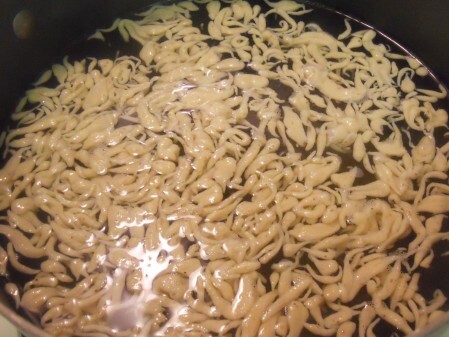 And I hope I’m not pregnant — Spaetzle’s shapes scare me, and its taste is just okay. Who makes it the best? 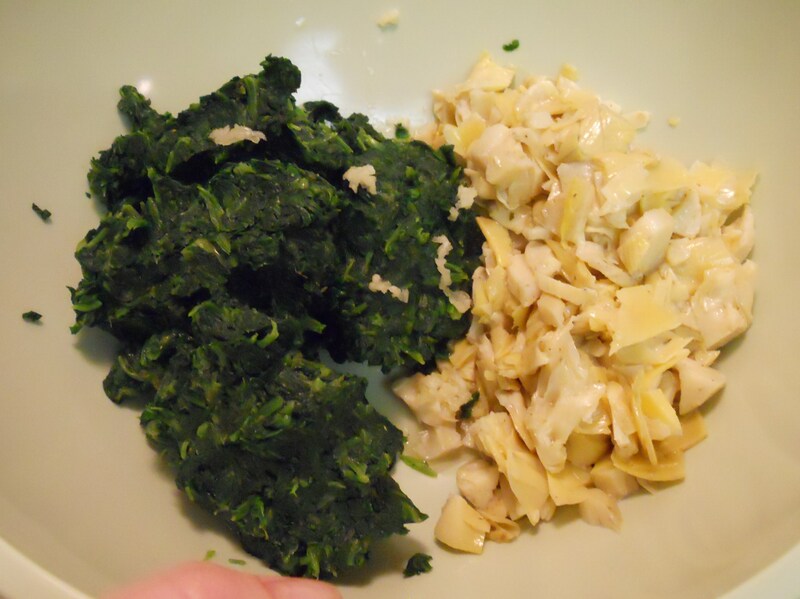 The recipe I used is linked here — Since I’m breaking up with Spaetzle, this post is fleeting. 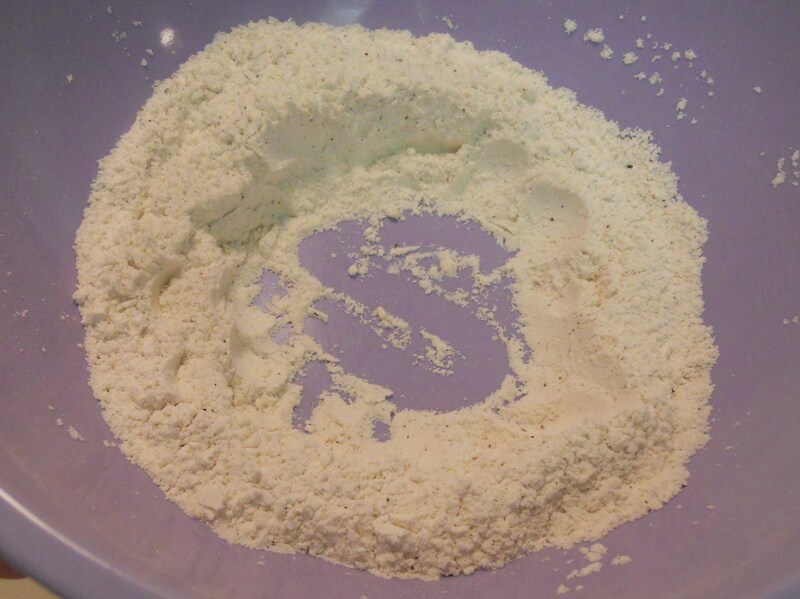 Add Salt, Pepper and Nutmeg to Flour, then form a well for a Milk and Egg mixture. 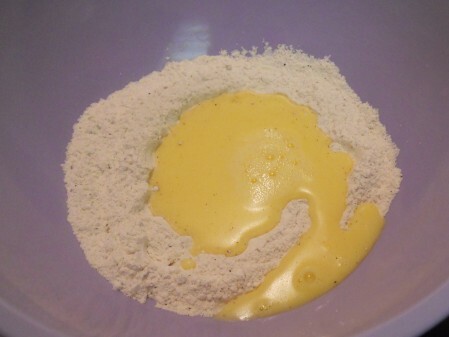 Stir Milk and Eggs into the Flour to form a smooth, thick Dough. The printed (halved) recipe is shown below and linked on the Food Network’s site. Once the Dough is prepared, it’s pressed through a colander into boiling Water. And then you end up with whatever happens naturally — Ghosts, sperm, baby octopus, etc. What do you think they look like? 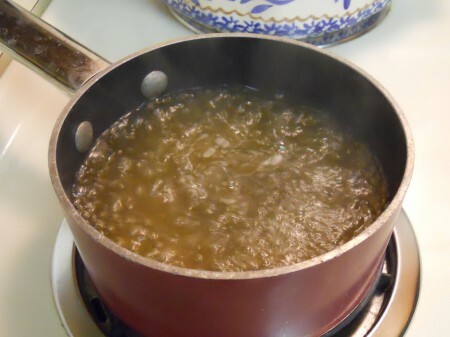 Cook for about 3 – 4 minutes or until they float to the surface. 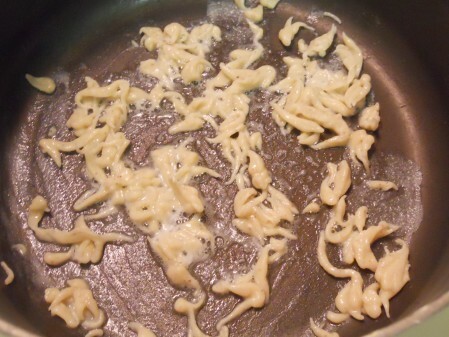 Strain the Spaetzle, then fry in Butter until browned and serve with Chives. 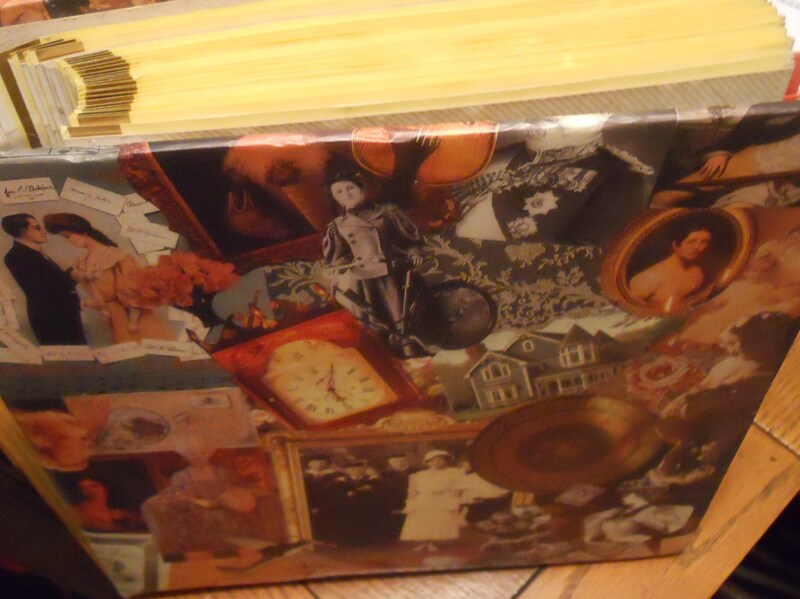 The final photos turned out blurry, which is just as well. There was no romance. It’s too heavy. Auf Wiedersehen Spaetzle — Maybe we’ll meet again in Germany, Austria, Switzerland or Hungary. 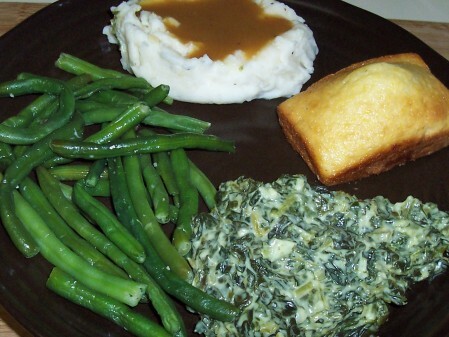 Boston Market: Chicken, Soup Or Just Sides, It Always Seems To Satisfy. I love a trio of Boston Market sides when there’s only time for a quick bite — Glad it’s nearby. 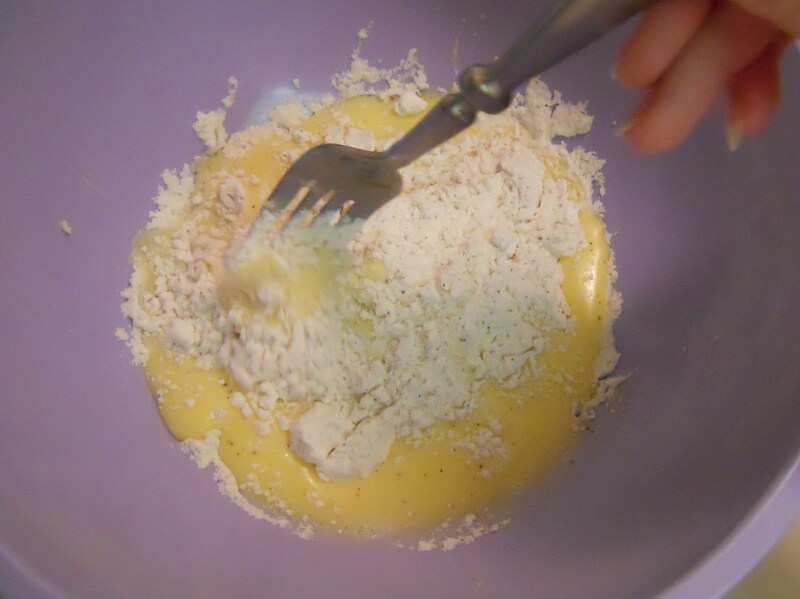 Calypso Tuna Cakes Recipe And Extended Challenge Recap. A few months back, I entered the Tonnino Tuna Chef Challenge for which I created a recipe using Tonnino Tuna and a video preparing same. 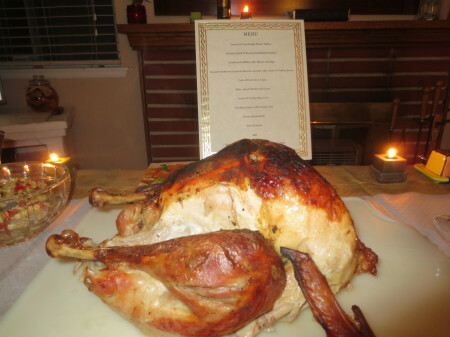 I didn’t expect to win (and didn’t), since my first recipe video was fraught with technical errors, but I did learn a lot, like not to take longer to combine the recipe ingredients than the video is allowed to be. That’s pretty important! 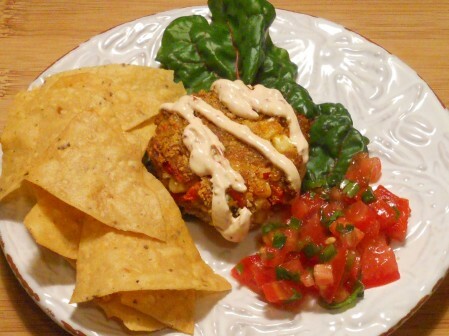 Aside from the video, the recipe turned out damn good — And now that the competition is officially over, I’ve decided to publish my Calypso Tuna Cakes recipe below. To find out more about the challenge, recipe and video see here. Regarding competitions, challenges and contests… It’s not cool, right, nor appreciated if/when entry deadlines are extended — It’s a little unfair, inequitable, unprofessional, misleading and disrespectful to those who entered on-time or by the competition’s posted deadline. The Tonnino Tuna Chef Challenge deadline was extended twice. I didn’t like that and hope not to encounter it again. 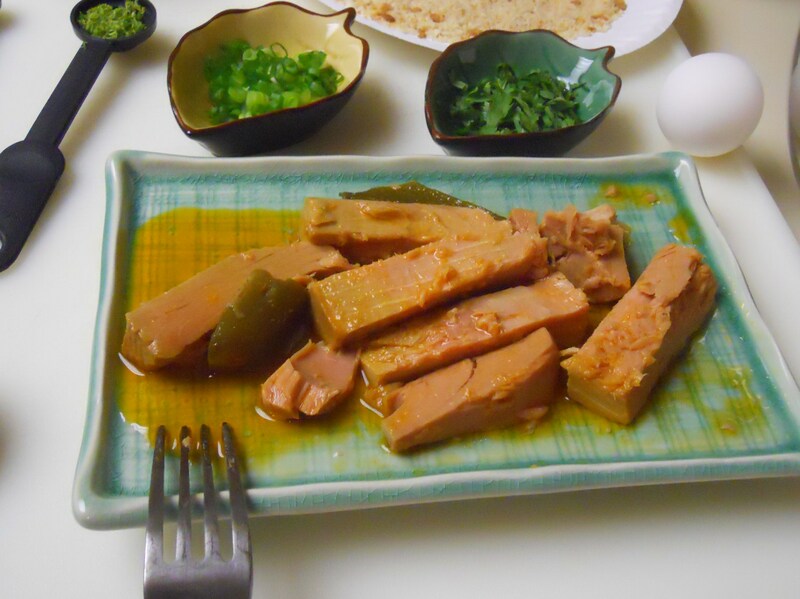 However, I am pleased to discover Tonnino’s high quality Tuna. It’s impressive, but not inexpensive. 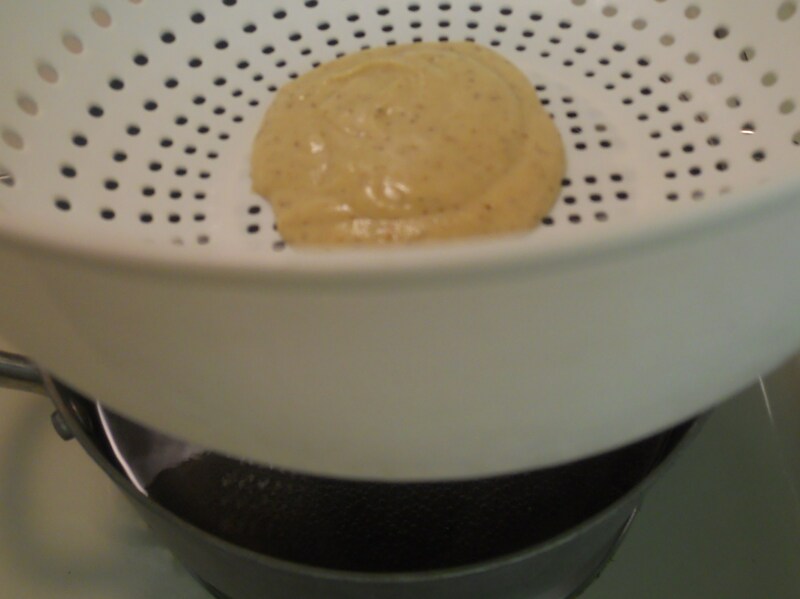 * A little reserved Jalapeno Olive Oil, if necessary to moisten Tuna Cake mixture (optional). 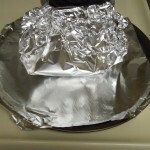 Preheat oven (and a baking sheet) at 400°. Combine all ingredients reserving 1/4 Cup of Bread Crumbs on a plate. 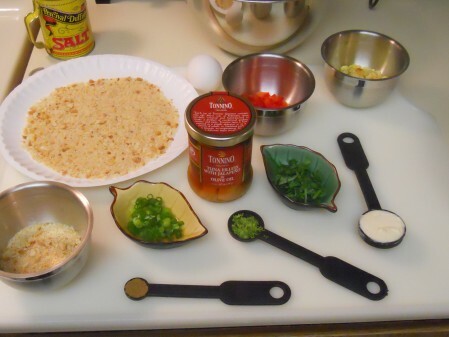 Mix other ingredients together and form into (4 – 6) Tuna Cakes depending on preferred size. Coat each Tuna Cake with the reserved Bread Crumbs. 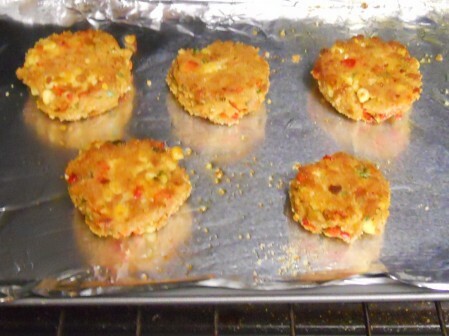 Add Olive Oil to the heated baking sheet, and then add the Tuna Cakes. 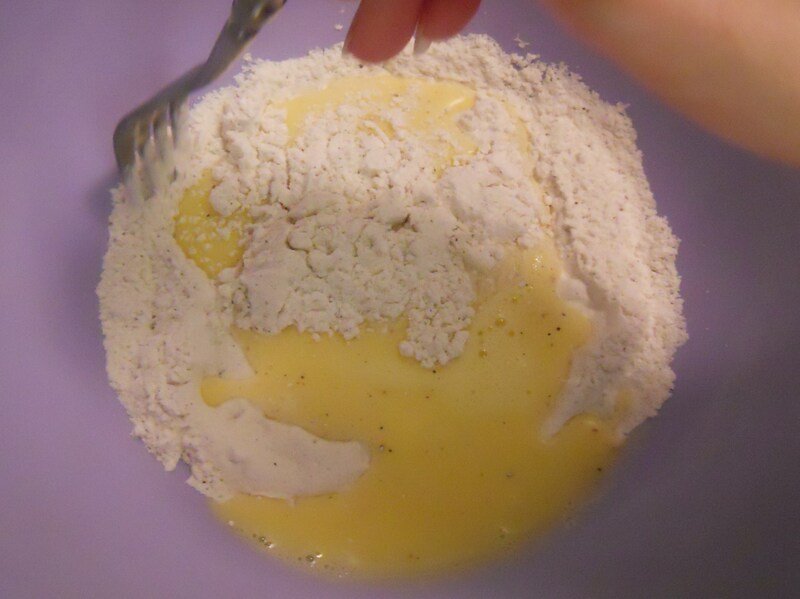 Bake for 15 minutes turning once halfway through. Remove from the oven, cool slightly and dig into the Calypso — YUM! The Calypso Tuna Cake above was served with a blend of Chipotle Peppers and Sour Cream, Pico De Gallo and Hava Chips. And they’re named ‘Calypso’ for their regional ingredients, vibrant colors and tasty flavors, likened to the enlivening feeling of Calypso music. Finally, it just so happens that I’ve met John of Food Wishes, the guy who actually won the Tonnino Tuna Chef Challenge and he’s a cool guy. Congratulations John! 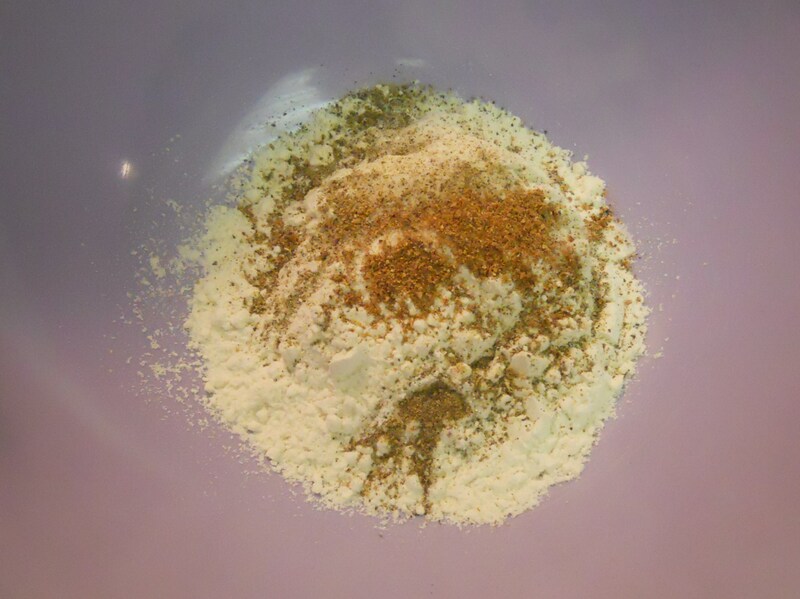 * Unfortunately the final Calypso Tuna Cake photos aren’t as fabulous as the recipe, but had to show something — To be replaced when made again. Zinc Cafe & Market In Corona Del Mar And The Ocean Nearby. 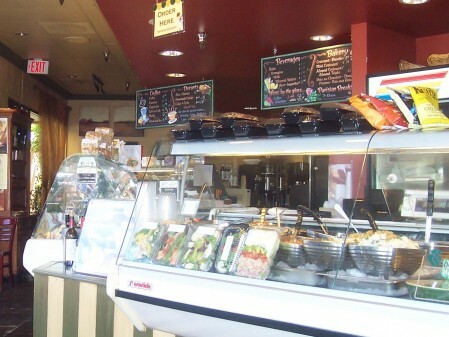 We recently wandered into Zinc Cafe & Market in Corona Del Mar a half hour before closing time and happily learned that their Market Salads are 1/2 price during that time, the last half hour before closing. It was great timing for us, thus we went crazy and got eight of them, five are pictured here and all are always good. They offer a shady outdoor patio too, but we enjoyed our Salads on the beach (away from the seagulls) and for lunch the next day. What a deal — It’s the best time to go there. We didn’t capture the official name of each Salad, since we ate them so fast — Many are seasonal anyway, so you’ll just have to see what’s available and check out their website to see what’s possible. They offer a lot and will tell you more than we can. 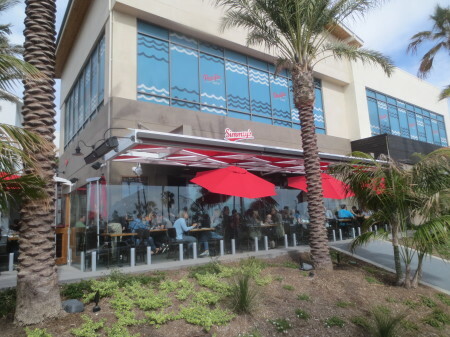 The beach is walking distance from Zinc Cafe & Market in Corona Del Mar. If I could own a home anywhere around here, it would be in Corona Del Mar, near many restaurants and the amazing beauty pictured below. 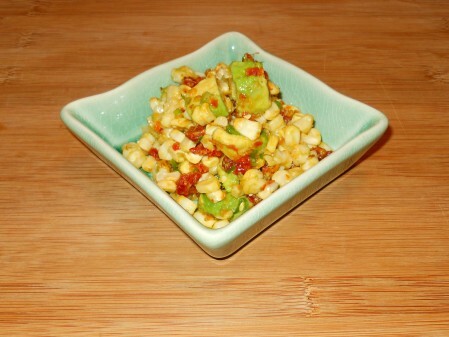 Easy And Tasty Roasted Corn Salad Recipe. The photo certainly doesn’t do this easy Roasted Corn Salad combination any justice (sorry about that). 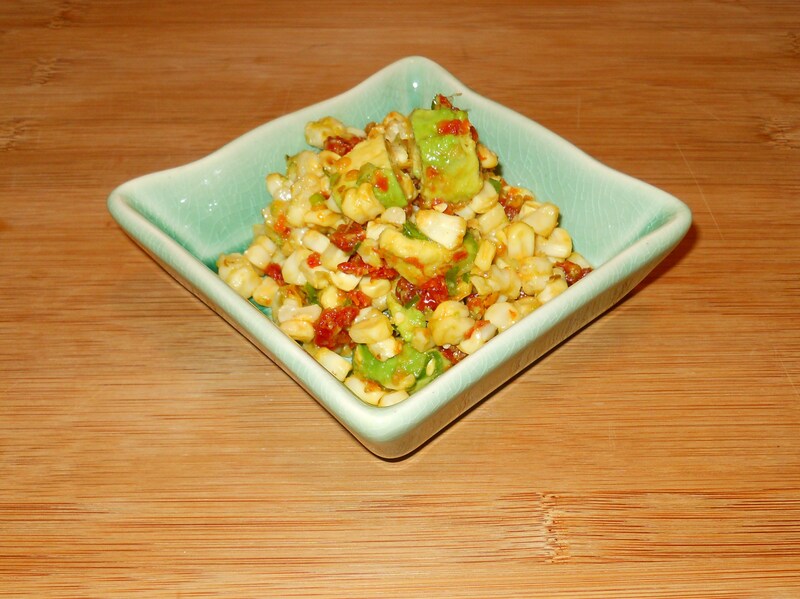 The recipe is simply a mixture of Roasted Corn (cut off the cob), Sun Dried Tomatoes, Avocado, Green Onions and Sea Salt — That’s it. 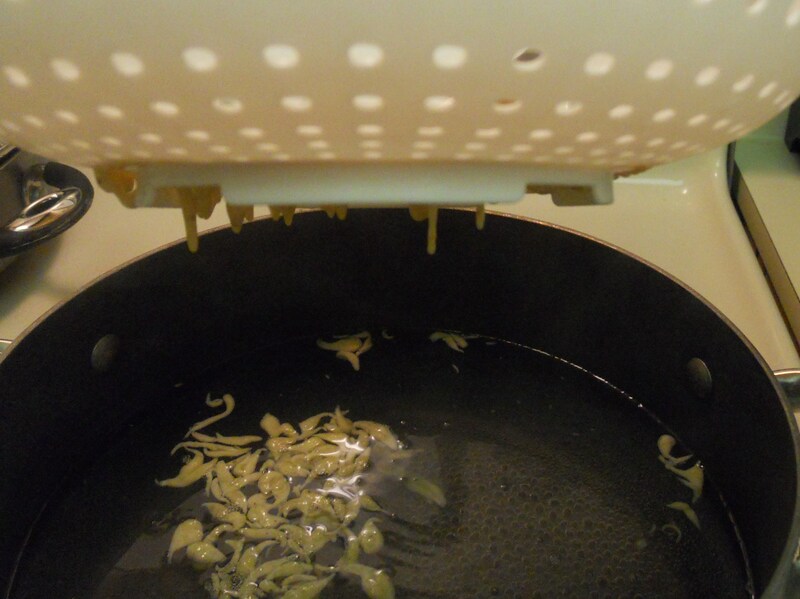 No Oil and no Vinegar, but it works. 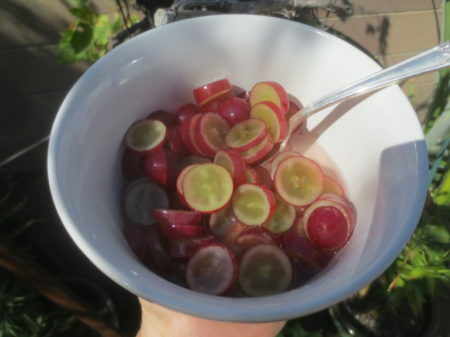 I was sceptical at first, but this is a tasty Salad that doesn’t seem to lack moisture. 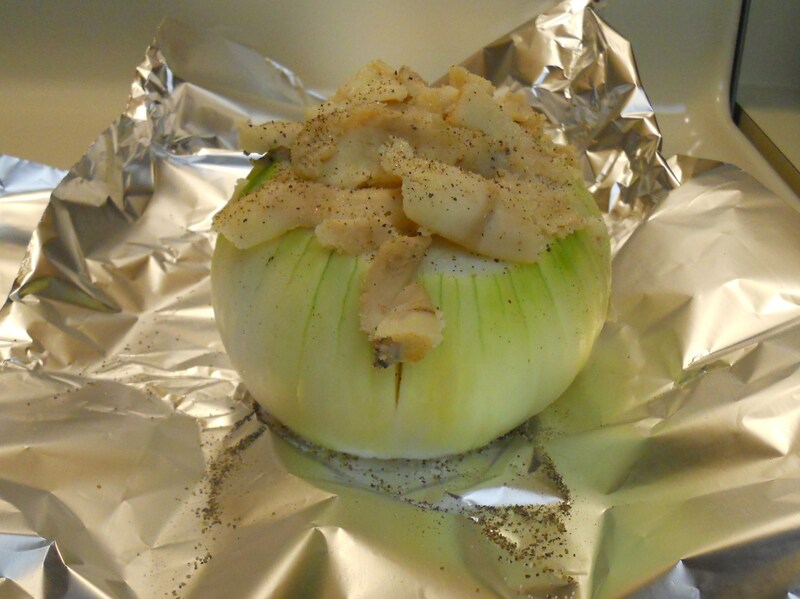 Easy Recipe: Giant Baked Sweet Onion For Two. 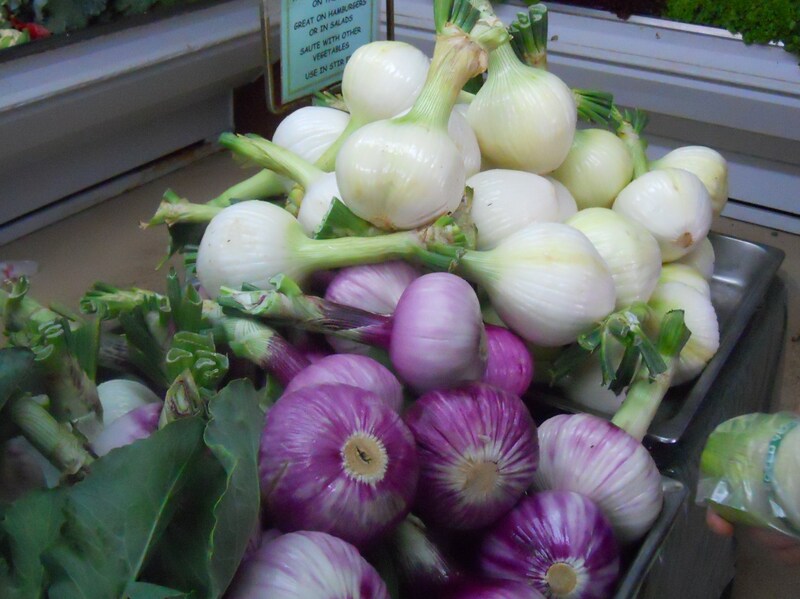 The largest Sweet Onions in town can be found at Tanaka Farms. 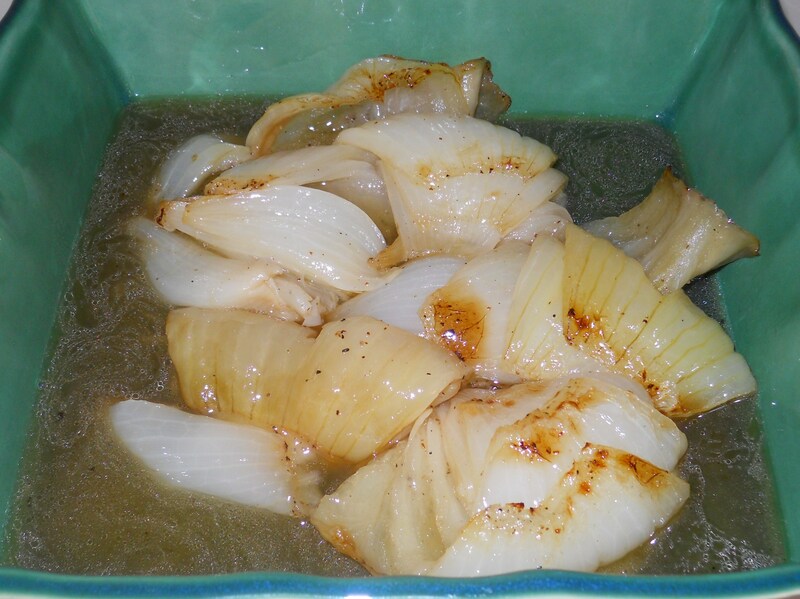 Continuing our report about our recent visit to Tanaka Farms — In addition to the Strawberries, we took home a giant Sweet Onion to make one of our favorite side dishes, Baked (or BBQ’d) Onions. 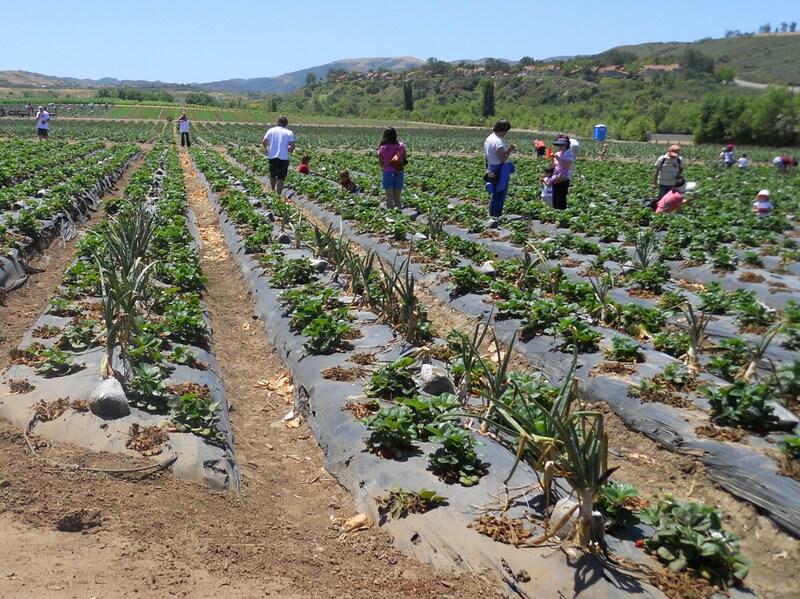 Tanaka Farms grows their Onions amongst the Strawberries. 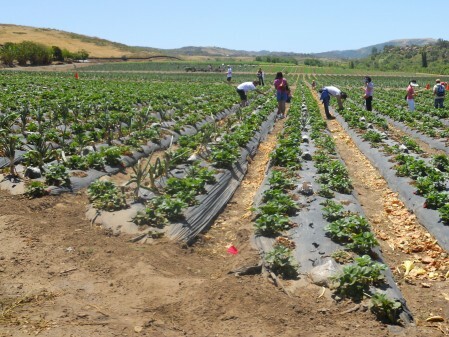 They say it helps to keep certain pests away from the Strawberries and it sweetens the Onions. 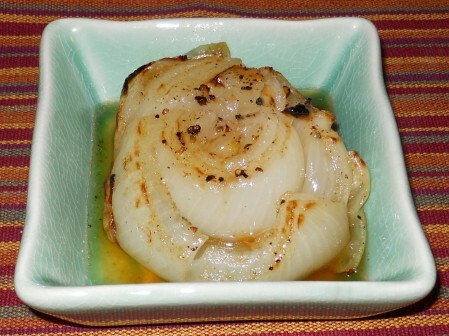 Baked Onions aka Onion Candy is a much loved side we often enjoy with Filet Mignon and loaded Baked Potatoes. 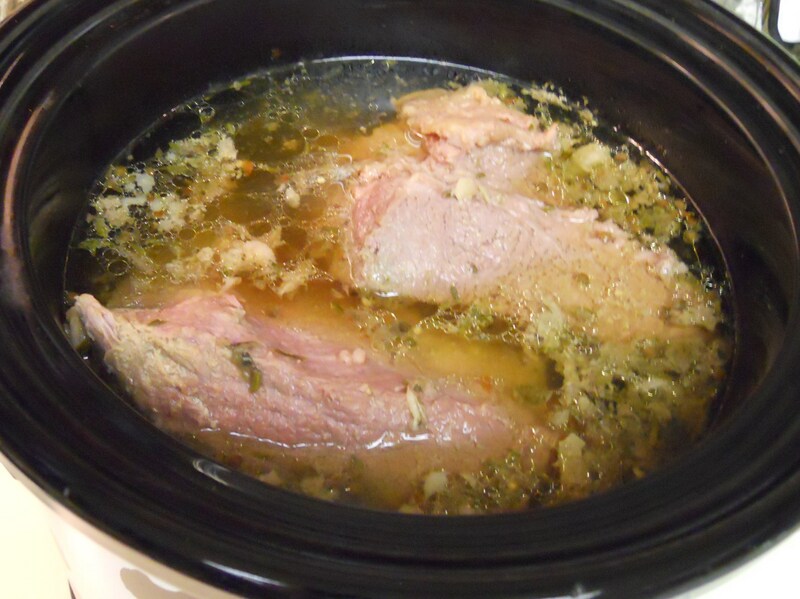 We’ve previously posted the recipe here. 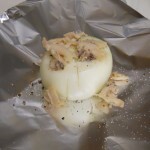 Without visiting the above recipe link, know here that it’s an Onion that’s tented in foil with Bacon Grease, Salt and Pepper — And then it’s baked in the oven or on a BBQ for about an hour. 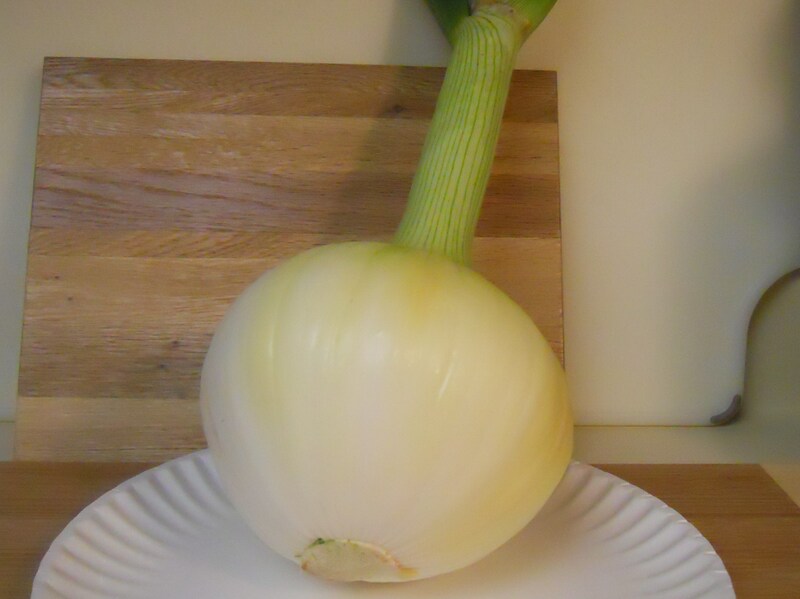 This extra large Onion took longer (a little under 2 hours) and indeed it was incredibly sweet to eat. It served two very well. 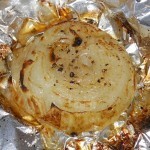 Baked Onions are so easy to make. The rule is generally (1) Onion per guest — If getting them from Tanaka Farms, they can be shared. 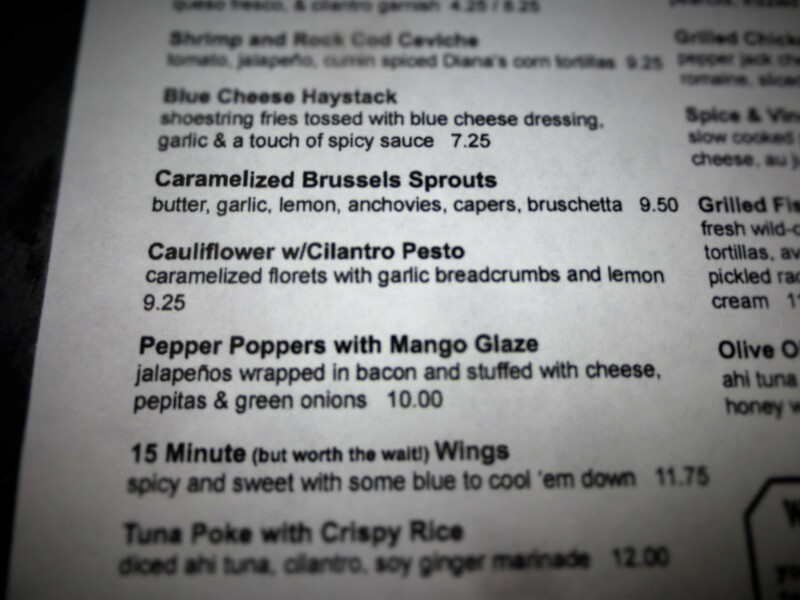 If this doesn’t sound good to you, it’s understandable — We once appalled at the idea too, but they’re sooooo good. You might be missing out. 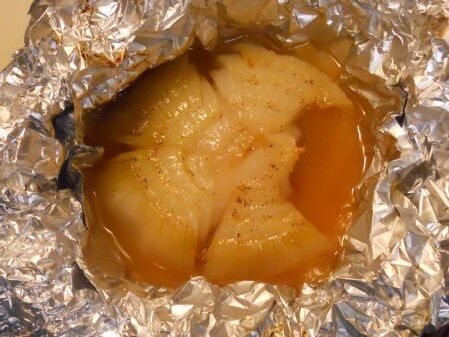 Would You Believe This Baked Onion Tastes Like Candy? Indeed, this Baked Onion tastes like Candy. Growing up I would have gaged over the thought of it, but an Onion baked with Bacon Grease in the oven or on a BBQ is so sweet and delicious. It just melts in your mouth. 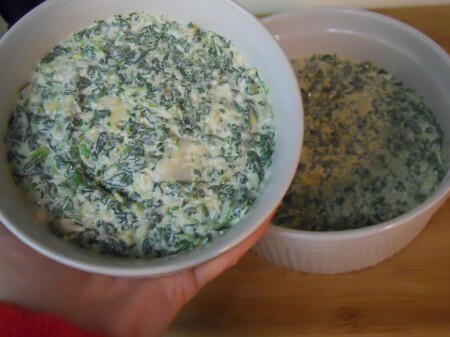 And it’s super easy to make and impressive to serve as an appetizer or side dish. It’s optimum for a fall or winter dinner party or all year long with meals. My family has prepared countless bushels of Baked Onions over the years. They’ve mostly cooked them on the BBQ, but when it’s cold it’s convenient to cook ’em inside. They take about an hour to cook without much effort — As pictured above (l-r), trim the ends and skin of an Onion then make a few shallow cuts. 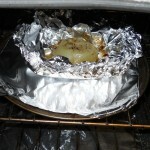 Place it on two layers of foil, then top the Onion with reserved Bacon Grease, Salt and Pepper. Tent and seal the Onion in the foil and bake at 450° for 1 Hour. It should then just fall apart in sweetness. Many times we’ll unwrap and broil the Onion over top for an additional 5+ minutes before serving. It’s so darn good! 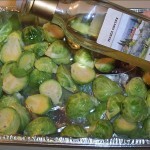 Brussels Sprouts Roasted In The Oven With White Balsamic & Olive Oil. 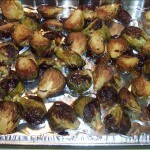 Inspired by the coverage of the Foodbuzz Blogger Festival, I made Roasted Brussels Sprouts. At the Outstanding in the Field style dinner held at the Greenleaf Warehouse in San Francisco, it seems like everyone loved the Brussels Sprouts. They looked terrific on the various event recap posts, which made me want to make ’em. 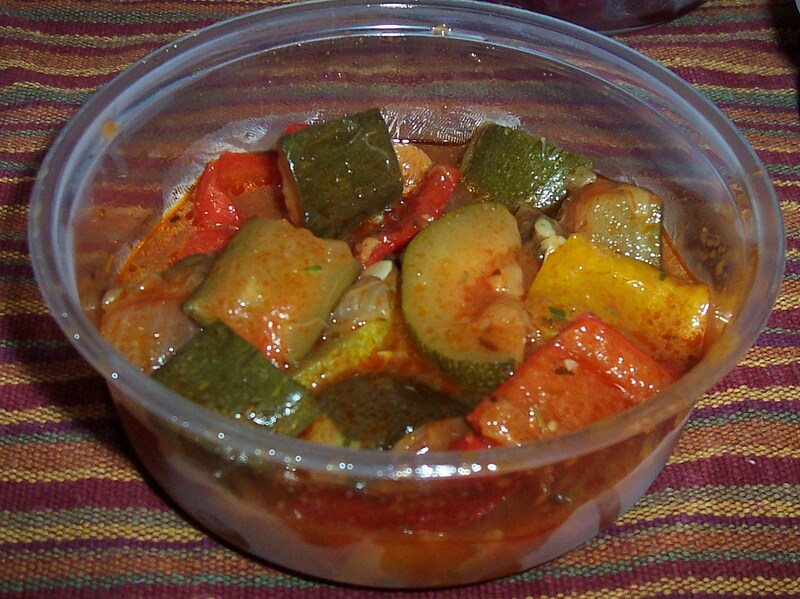 The recipe of the actual dish served at the festival is here, but I made something else. 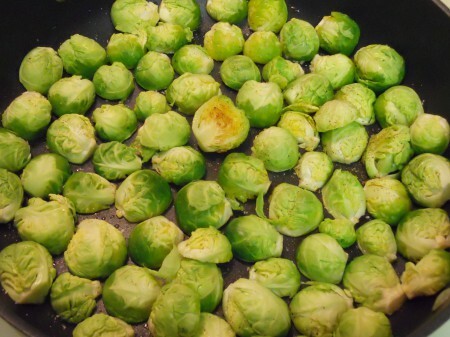 These Brussels Sprouts have a nice roasted char, but different ingredients. I tossed this bunch of hot water washed, halved Brussels Sprouts with Olive Oil, White Balsamic Vinegar and Salt & Pepper — That’s it. 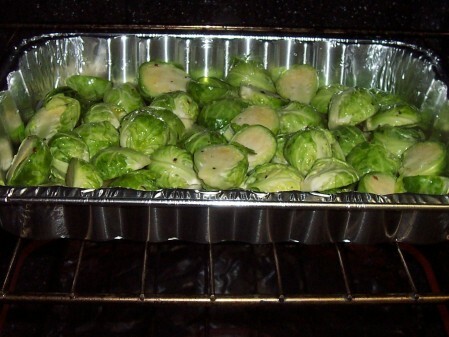 Just roast all in a 425° oven for about 25 minutes. 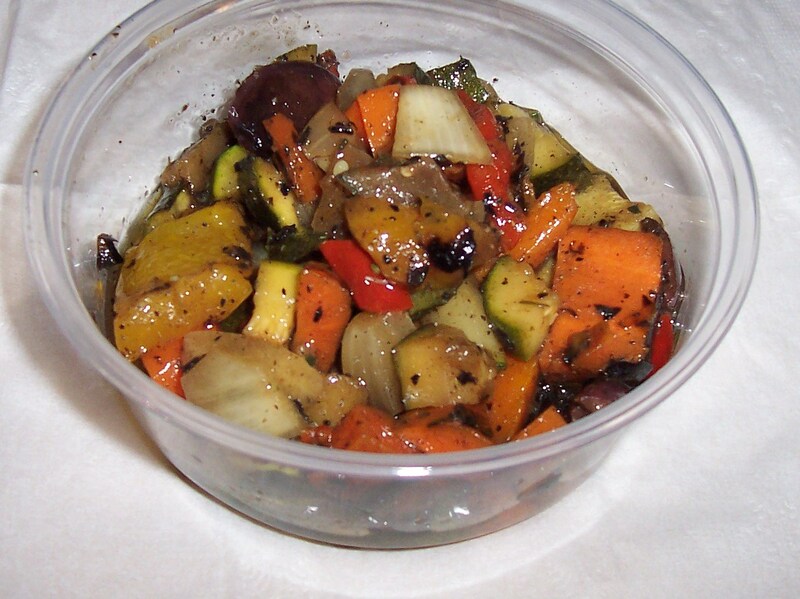 Stir occasionally and add more Olive Oil and Vinegar as necessary or to taste. They turn out sweet and caramelized. 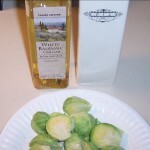 I can’t say these Brussels Sprouts are as good as those served at the Foodbuzz dinner, since I sadly wasn’t there, but they’re darn good and easy to make with what’s on hand. I’ll surely make them again — Super easy and tasty is my favorite combination. 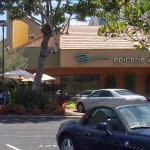 Pascal Epicerie & Wine Shop In Newport Beach. 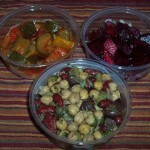 I’ve only just begun to explore the goods offered by Pascal Epicerie and Wine Shop and I’m already hooked on the Salads. 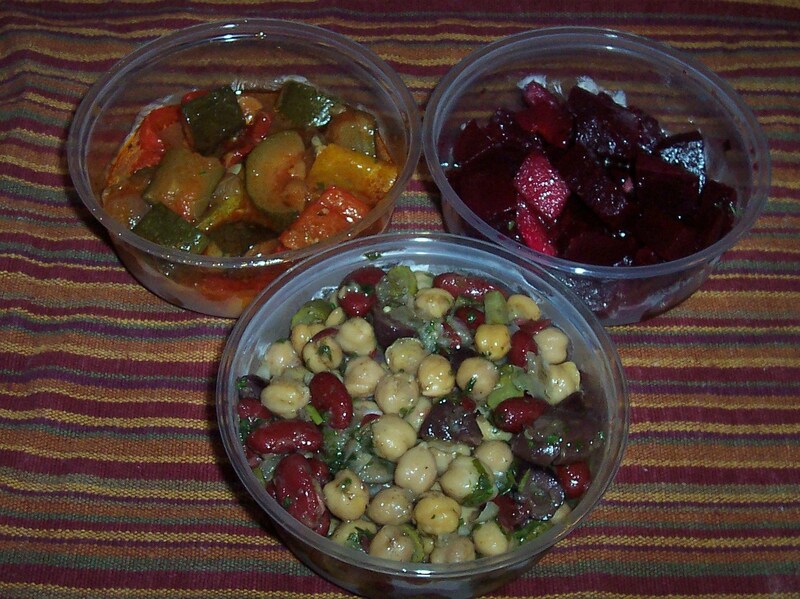 I’ve stopped in 3 of the last 4 days to choose from the Daily Pasta and Vegetable Salads offered by the pound. So far we can’t get enough of the Bean Salad(s) and Roasted Vegetables — The Green Beans aren’t pictured, but they’re my favorite so far. 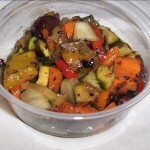 Pictured with the aforementioned is the Ratatouille and Beet Salad. We look forward to trying ALL their Pasta and Vegetable Salads, to be posted here soon. 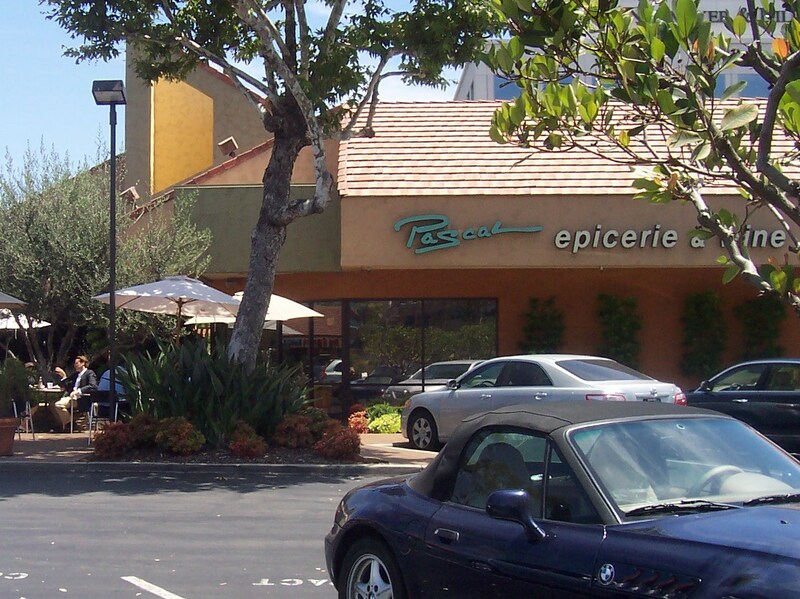 Pascal Epicerie and Wine Shop is next door to Tradition by Pascal, one of the best restaurants in Newport Beach.